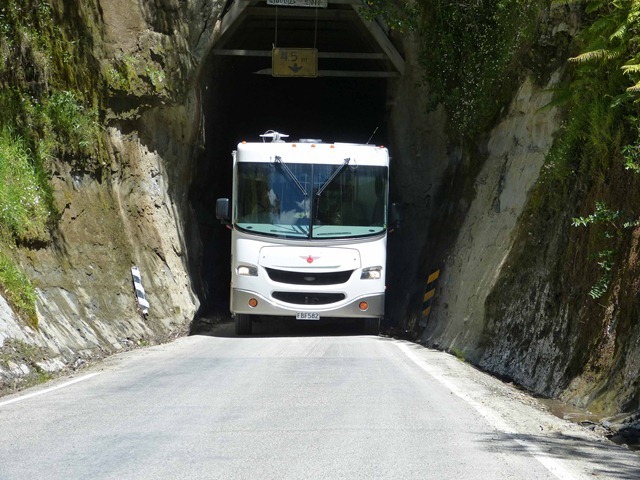 Firstly, in response to a comment on a previous entry asking how we found driving through the Forgotten Highway in large vehicle towing a small vehicle…..it was absolutely fine, no problems, worries or woes. Either that means we are becoming more used to driving over narrow, twisty roads, or the anxiety levels are reducing! Friday and it is get ourselves sorted day. Bernice needed a haircut and something done to her hair to cover up the sudden arrival of a multitude of just the one shade of gray! Off to town and suitable appointments were made for later in the afternoon. Meanwhile Roy had business to attend to. 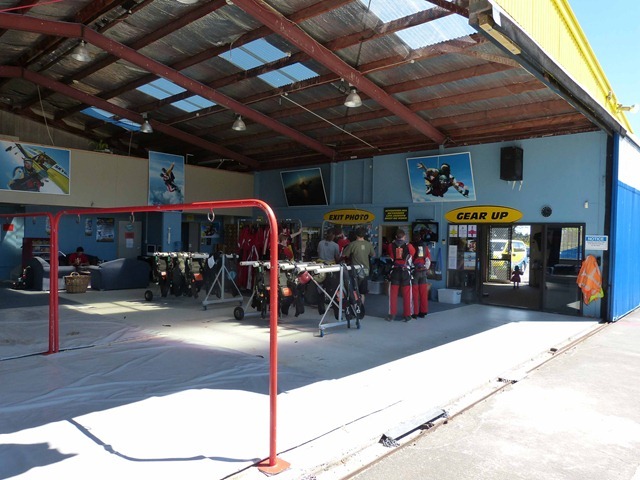 Right next door to the Payne’s is the Taupo Tandem Skydiving venture. 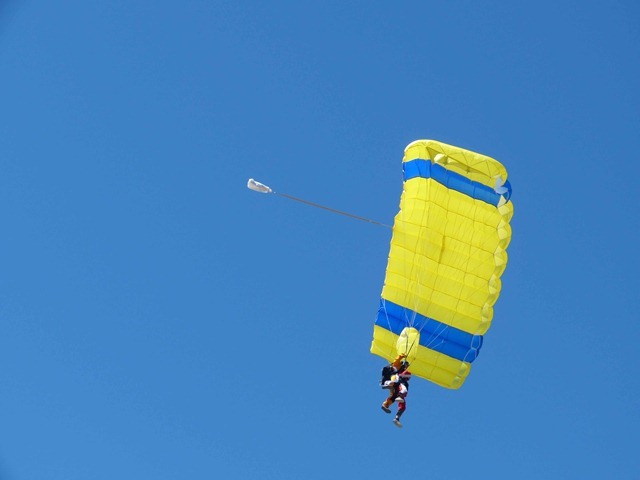 Watching the activities consumed a fair bit of time over the weekend. 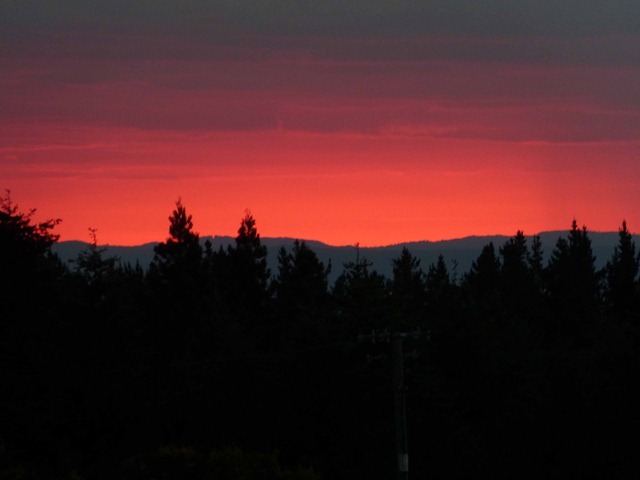 All these photos were taken from our vantage point from Barry & Sandra’s apartment. 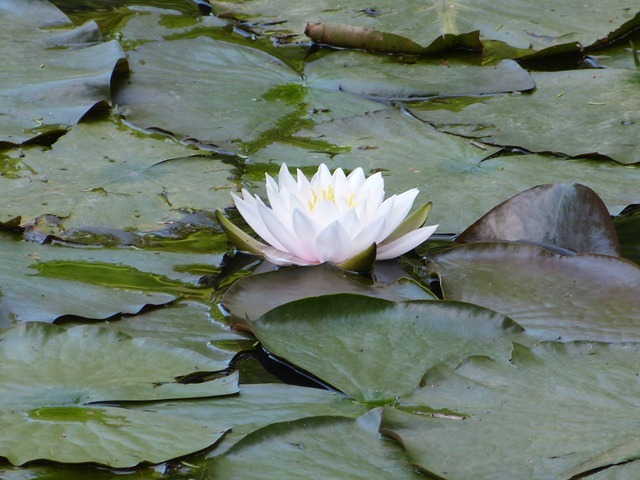 Sunday, and someone has a birthday. They seem to roll around with monotonous regularity and the numbers keep getting larger. Lunch was had out at the French Cafe and Hilary joined us along with some friends of the Payne’s. 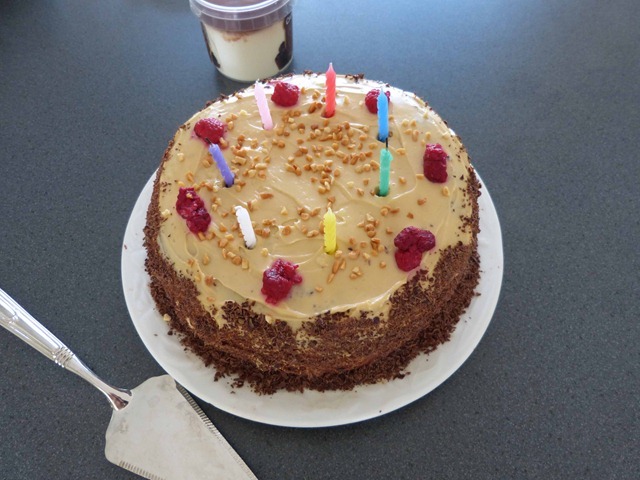 Then it was back to their place to have the wonderful coffee chocolate layer cake Hilary had made for me. the delicious cake, complete with random number of candles. Now, a couple of challenges have been set today, more on both of these will be progressively announced in the next weeks, with regular updates occurring over the coming months. Watch this space! 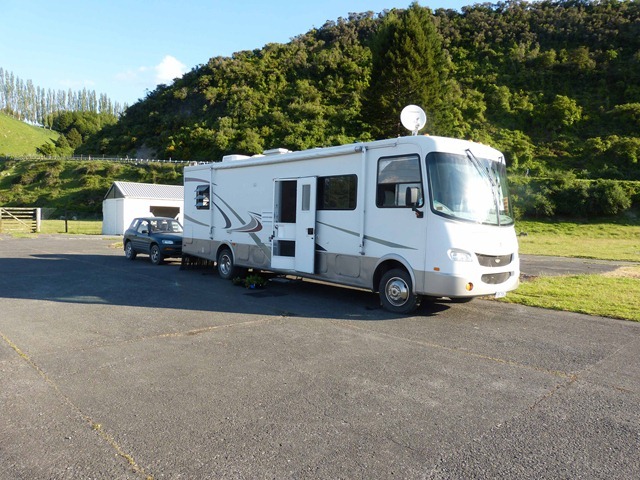 Later in the afternoon, Roy & Bernice headed around the corner to the NZMCA park to visit a couple we had met on the road over a year ago and to also make new acquaintances, over the usual afternoon happy hour. Happy hour extended to a few hours before we left and then headed round to Hilary’s to spend our last evening in Taupo with her. 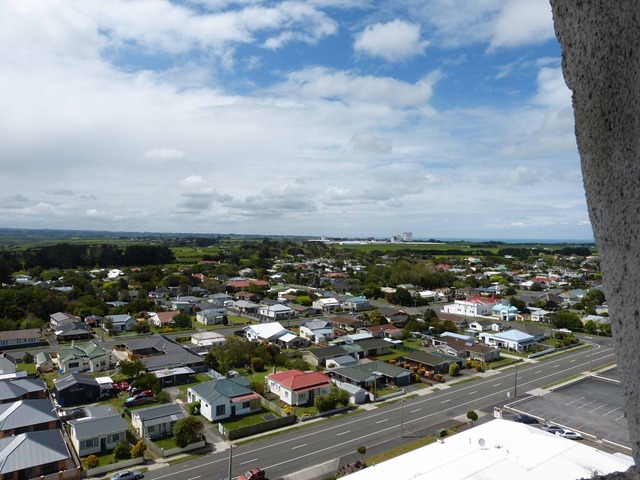 and headed to Putaruru where we will be staying with sister Sue and husband Jeff. An uneventful trip through some very familiar countryside. However, it was interesting to see the changes in the familiar landscape we once knew so well from our days of living in the region. 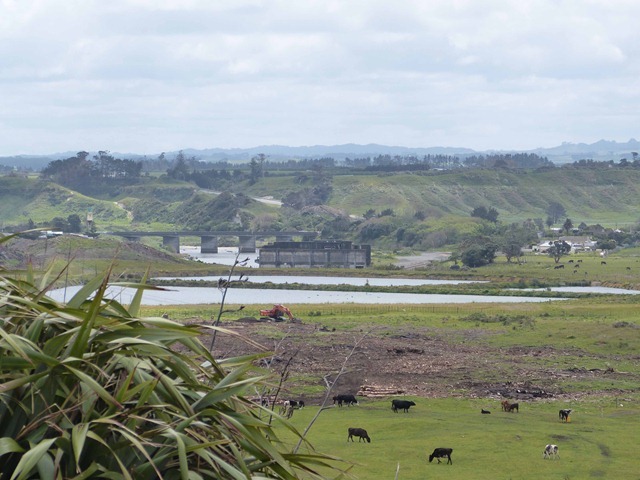 What were once forests of pine plantations are now cleared land for dairying. 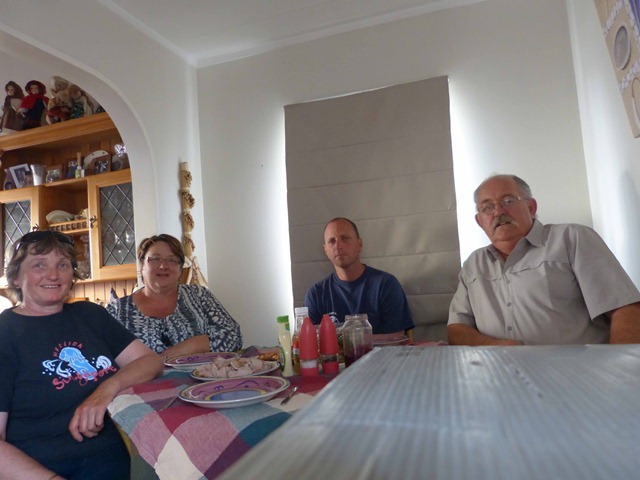 We arrived in Putaruru by lunch time and settled in for the evening of catching up. Tuesday morning and we arrange to meet up with Roy’s cousin Robert before heading to Hamilton to stay with friends Wade & Lindsay. 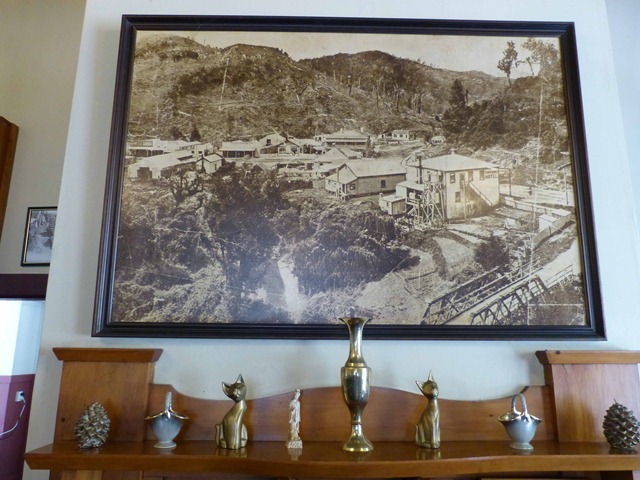 We are friends from just a few years ago (hmmm, is it really 30+ years) when we all lived in Tokoroa. There is apparently an annual event, a bike ride around the Lake. This requires, apparently, the repainting of the side markings on the road around the Lake. 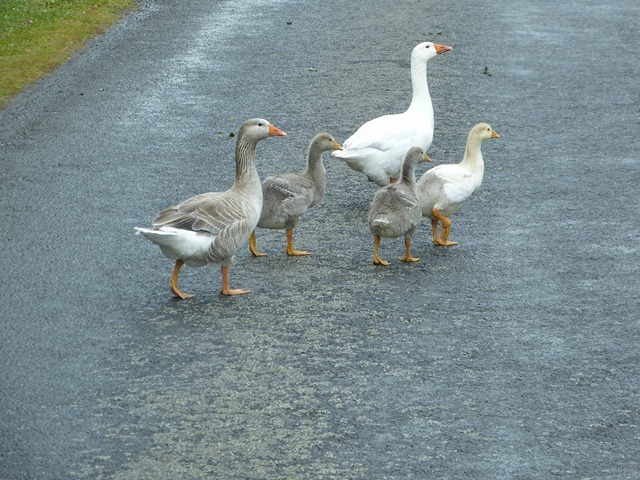 We were held up by the road markers who were proceeding along the road at a reasonable pace but much slower than the general traffic. After building up a tail of cars of some considerable length, they pulled over, we passed and all was well. 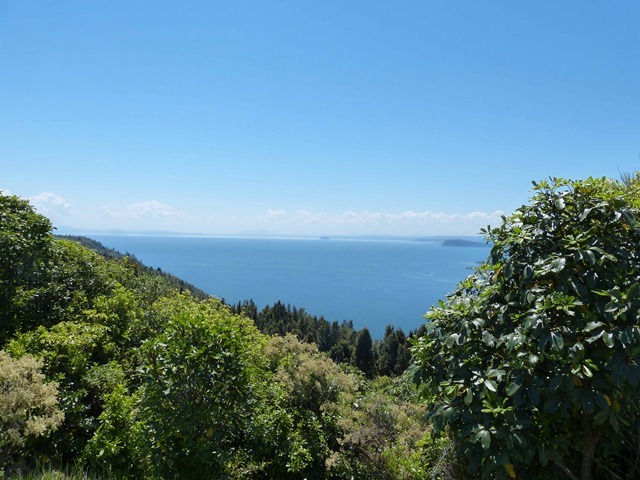 That was when we made a mistake, it was around lunchtime so some kilometres further down the road we pulled into a lakeside parking area. We had settled and were eating lunch when lo and behold the road markers passed. Of course when we got going again we rapidly caught the tail of the queue. But by now they had reached the windiest part of the road so we literally crawled along in a very long queue for the next fifteen minutes or so. Most frustrating, but at least it was a fine day and we were really in no hurry. 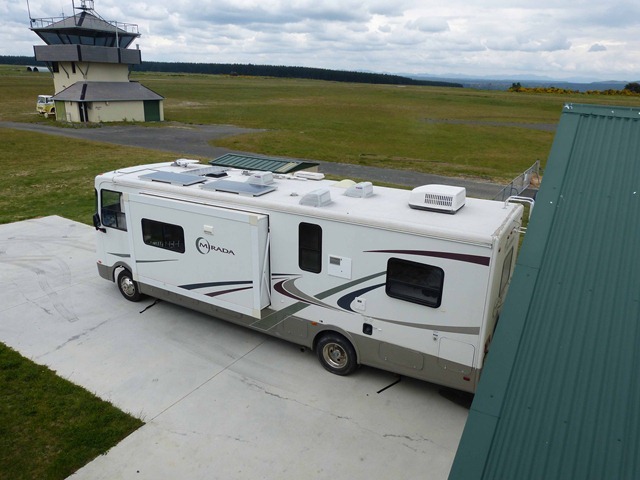 Finally reached Barry and Sandra’s at Taupo Airport and settled in. We managed to make out the mountains in the mist from where we are staying and the steam/smoke from the flank of the mountain was evident. 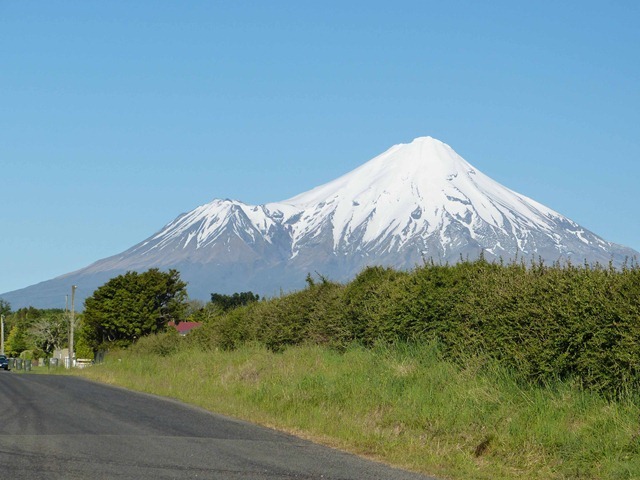 Having spent the past four weeeks travelling around in sight of Mt Taranaki we finally got to see it . 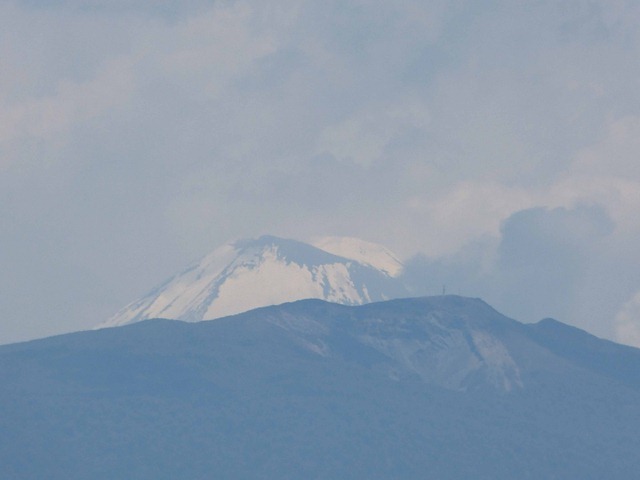 Mind you within hours of this photo being taken it once again hid its summit in cloud. 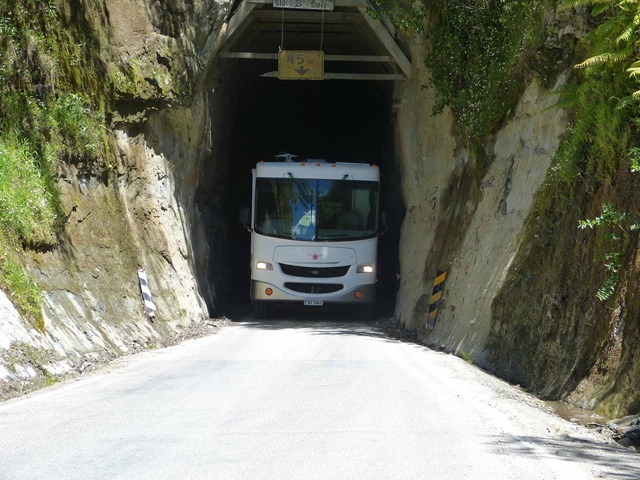 Once we fuelled up we headed off along the Forgotten Highway, with warnings from some ringing in our ears. Apparently the road is not for the faint of heart…well, especially in a large vehicle towing another vehicle, but we figured that Cattle Trucks et al head through, so we should too. 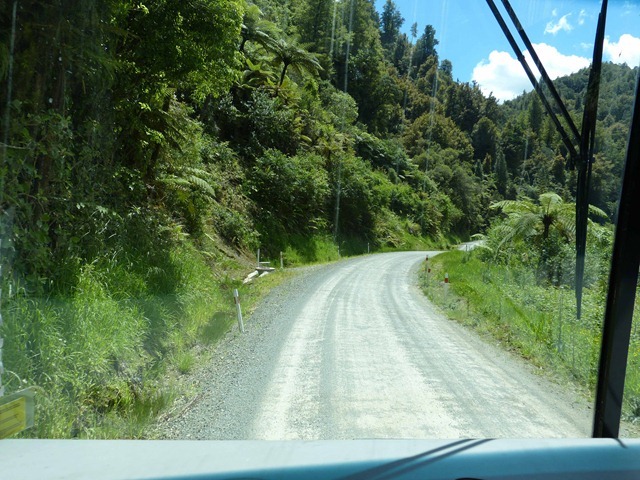 The first half of the trip through to Whangamomona was through pretty country, the road a bit twisty in places, but nothing too serious. 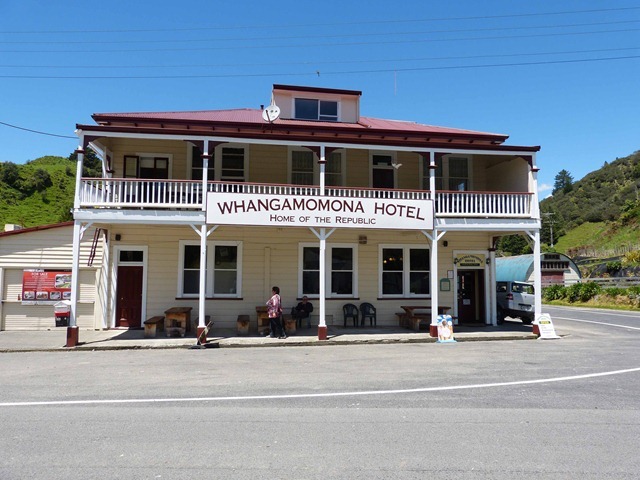 We stopped for a break and had lunch at the Whangamomona Pub. 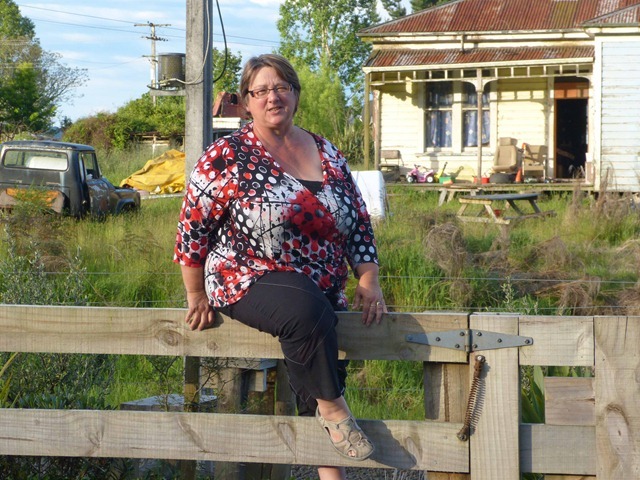 Whangamomona declared itself a Republic in 1989 as a reaction to county boundaries being redrawn and the town being removed from the Taranaki region. Every year since then, a Republic Day has been held. There is very little left in the town apart from the pub and a few old buildings. 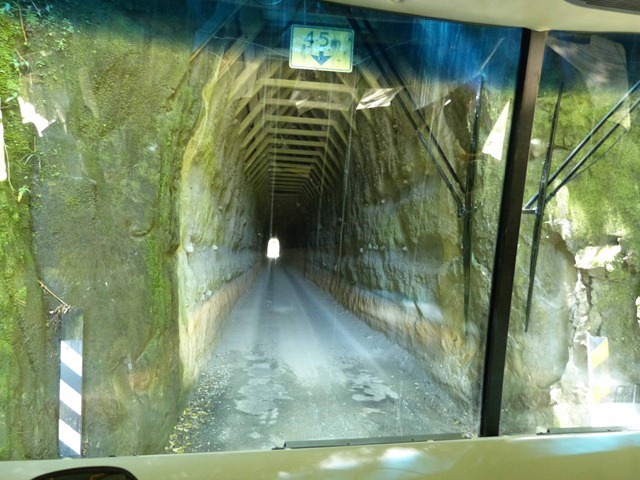 And then onto the Moki Tunnel aka the Hobbit’s Hole. 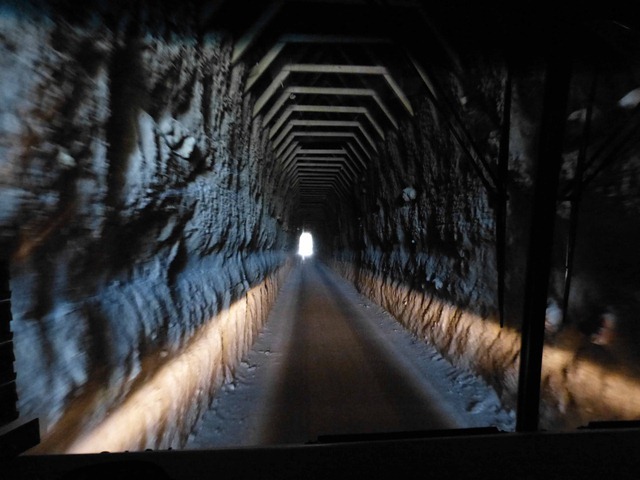 This tunnel is 180m in length and is hand cut, the floor of the tunnel was lowered a few years ago to enable three tiered cattle trucks through, even so its a tight squeeze. 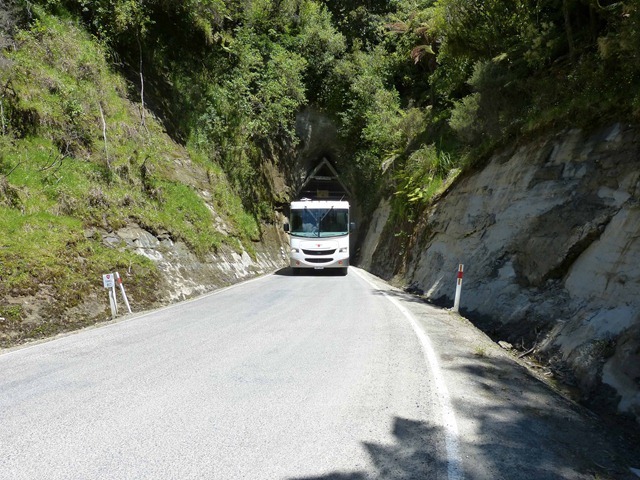 From this side of the tunnel, there is around 20kms of unsealed road, but it is fairly flat and not too twisty so it wasn’t too bad, although this is State Highway 43. Not quite the same standard as most State Highways. 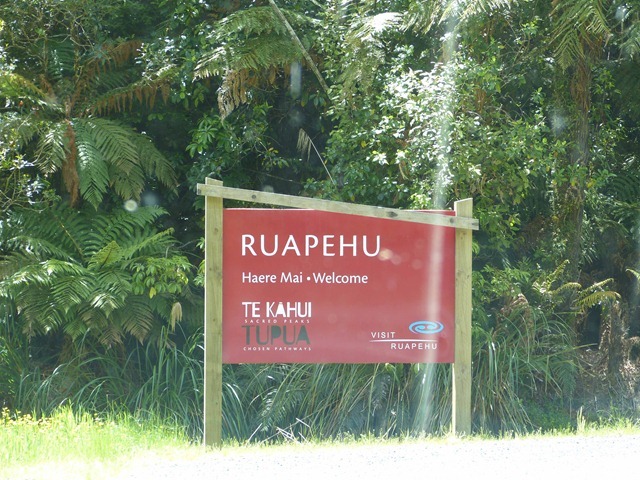 Then we left the Taranaki District and entered Ruapehu, and to prove it, here is the sign! To acknowledge our arrival into the Ruapehu District, Tongariro threw a wee party and blew off a bit of smoke and steam to welcome us, nice! 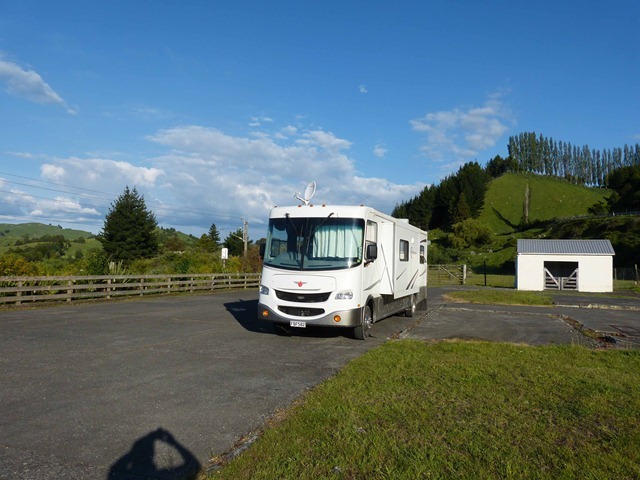 We headed straight through Taumaruanui and to the NZMCA parking spot at Piriaka just a few kms out of town. By this time, 4.30pm, it was pretty warm as well, with the temperature gauge hitting 26.5C so it was time to relax. 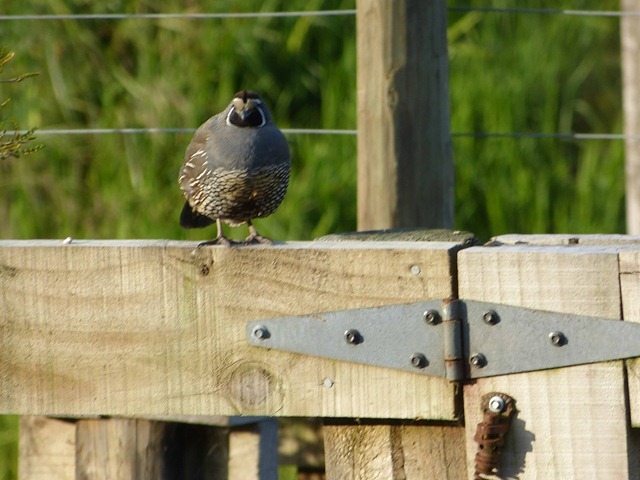 I have been requested from time to time of late to show some fence sitters, especially birds. So here we have it! A bird on the fence and then a second “bird” on the same fence. and this old “bird” was caught sitting astride the fence too!! This morning (Tuesday) we decided we would move on to Stratford, the start of the Forgotten Highway. 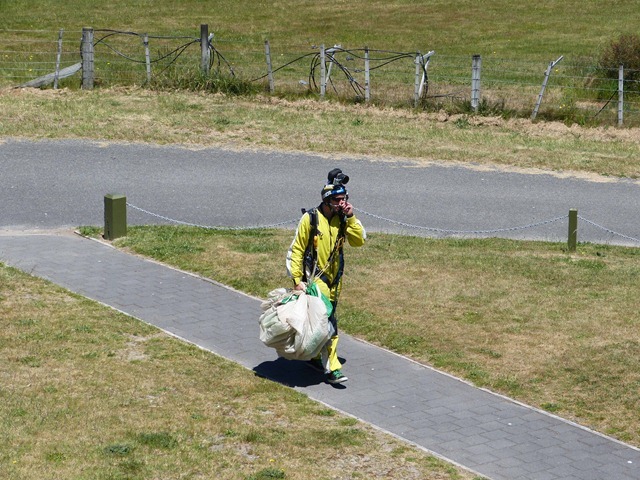 But first a recap of the past few days in and around New Plymouth. 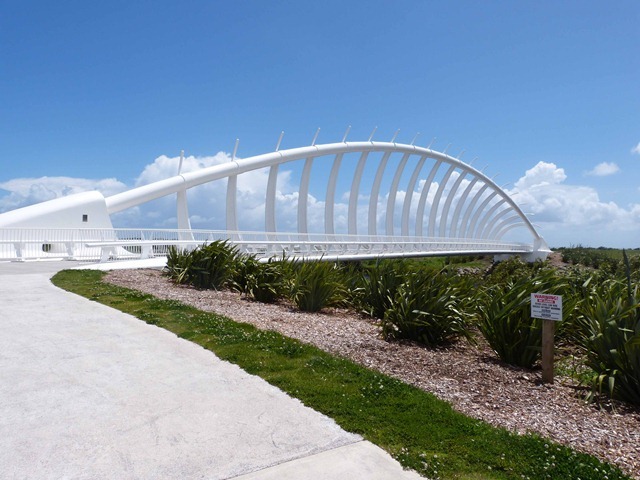 Sunday and we headed off for brunch with Chris & Amanda before they took us to see Te Rewa Rewa Bridge which forms part of the impressive 11km of Coastal Walkway. 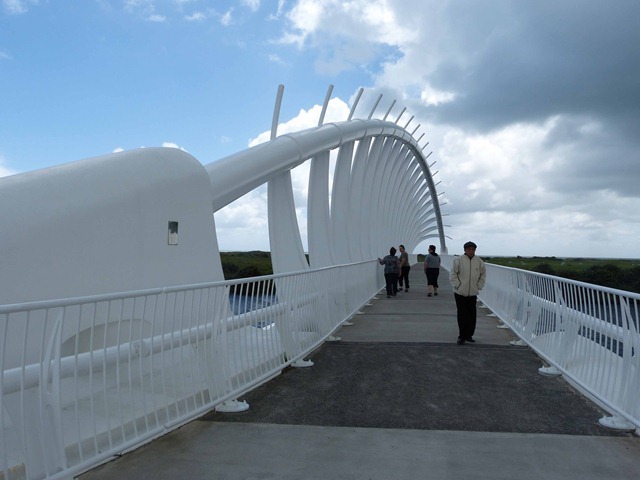 Beautiful from every angle, the 83m long bridge is reminiscent of a breaking wave or a whale skeleton. 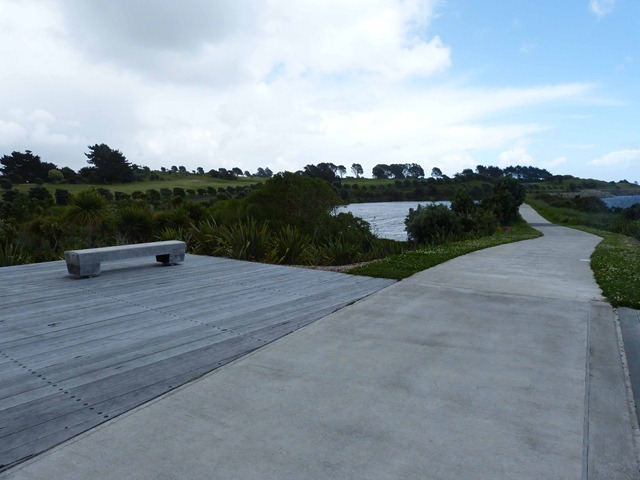 The coastal walkway is well formed, and planted and is a credit to the local community. For those who are unable to walk the length, then there are mobility scooters freely available! It would have been a great day for a long walk, however the wind was blowing so fiercely that it was very uncomfortable just being outside. 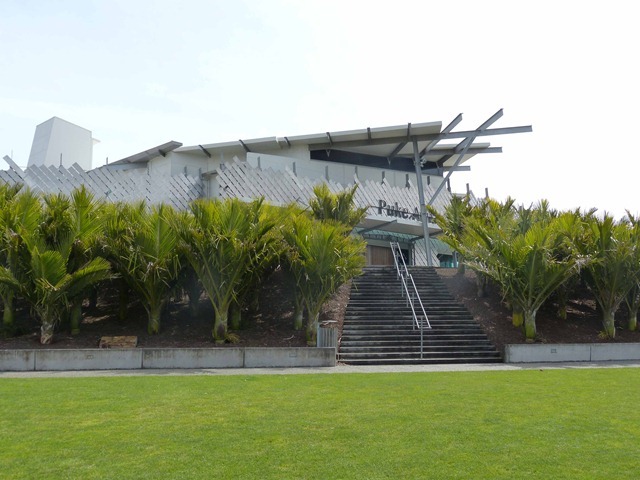 From there, Roy and Bernice headed into town to check out Puke Ariki, New Plymouth’s impressive museum and library complex on the foreshore. 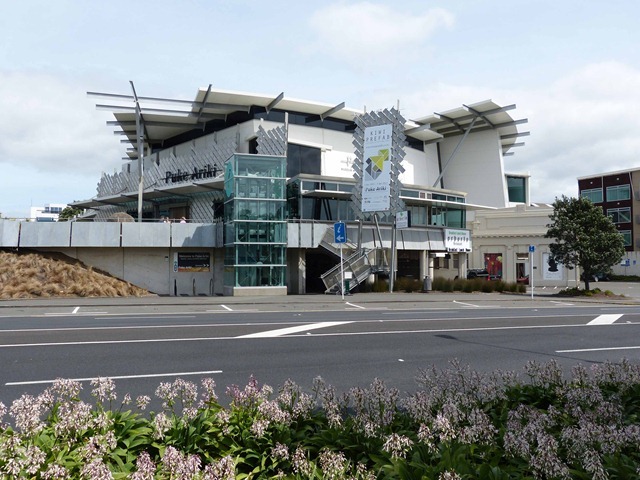 Unfortunately we just happened to time our visit to New Plymouth between major exhibits. Never mind, next time. 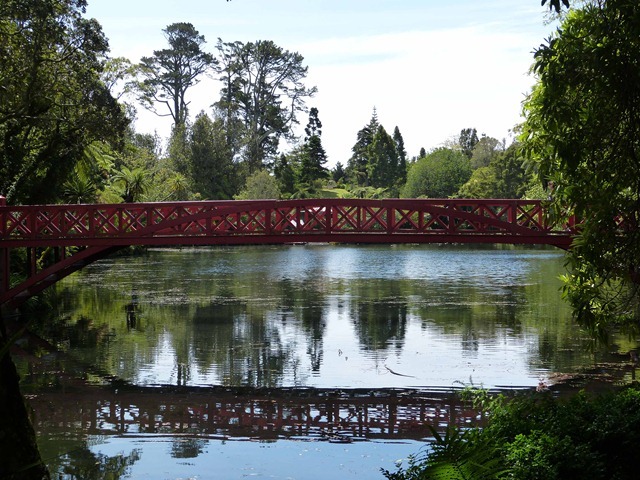 Monday and after a relaxing morning we headed in to have a walk around Pukekura Park. 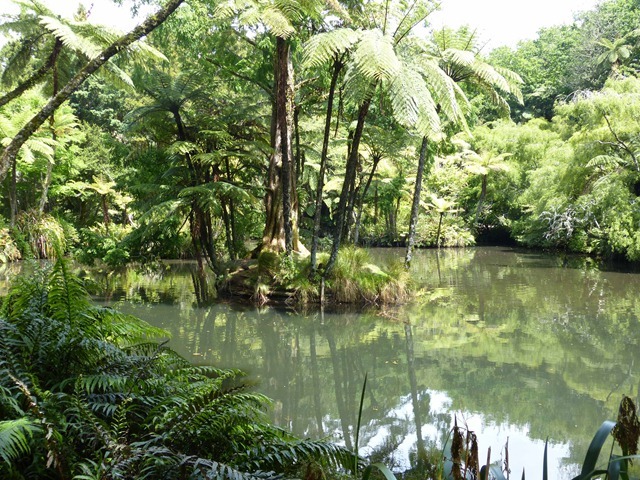 The park covers 52ha (128 acres) is right in the centre of the city. 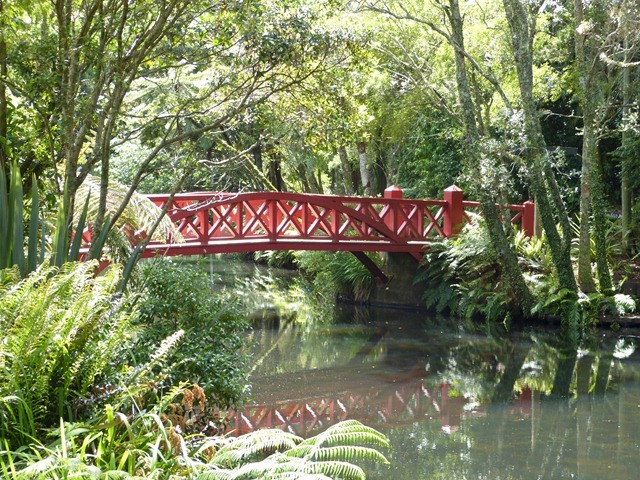 Pukekura is a fantastic example of botanical gardens with paths meandering through the various landscapes and diverse plantings. We were a couple of weeks to late to see the rhododendrons in their full glory, however we could still appreciate their beauty. 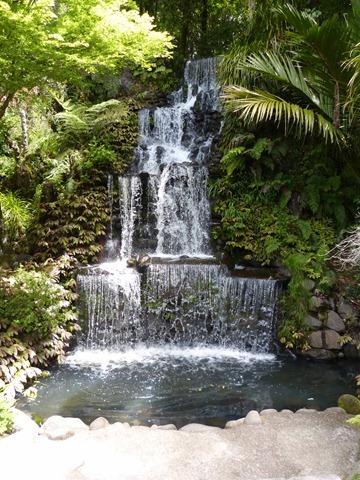 Although it must be said that our ex neighbour Anne Sim, has a comparable, if not better, rhododendron woodland garden just south of Oamaru. 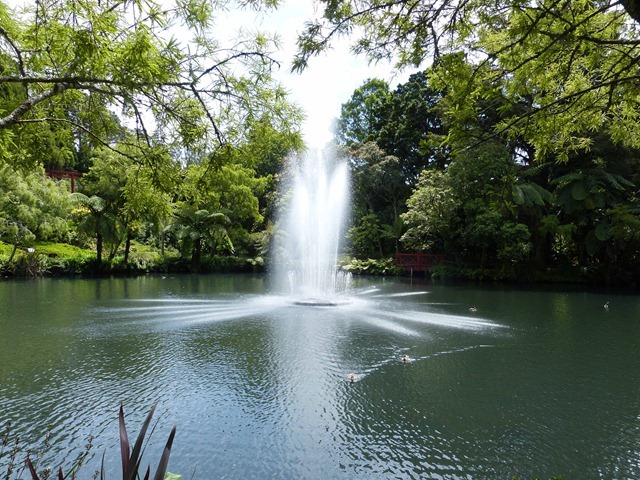 Fountain and waterfall in the park, both of these were activated by pushing a strategically situated button which set the pumps going to produce the effect. goldfish just for you James, sorry we could not catch a couple and send them down. 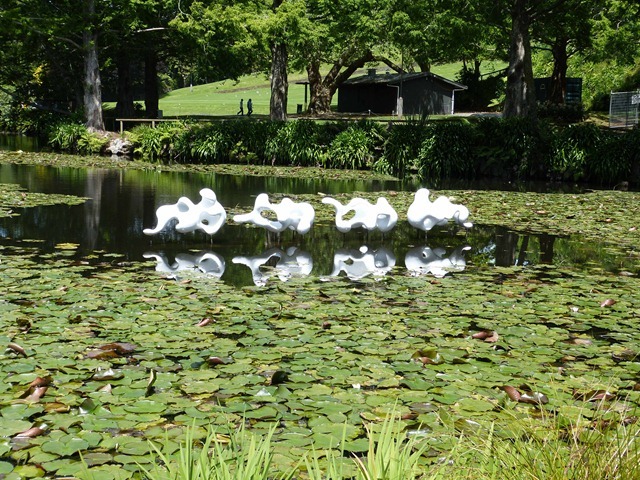 sculpture in the lily ponds, this one is called Aotearoa, land of the long white cloud. 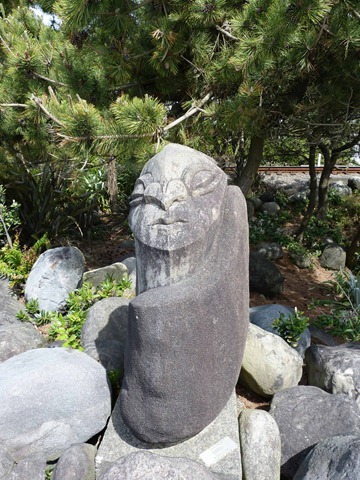 Situated around the museum and along the Coastal Walkway are a number of stone sculpturees. 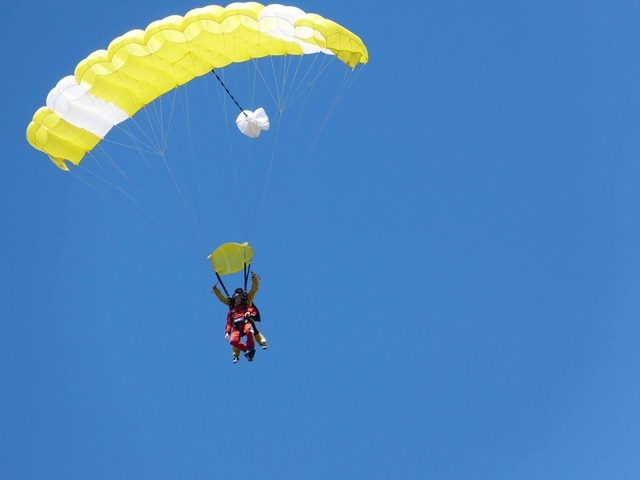 Some have association with certain persons, others with tribal affiliation and some with no particular import other than providing a pleasing and thought provoking form. 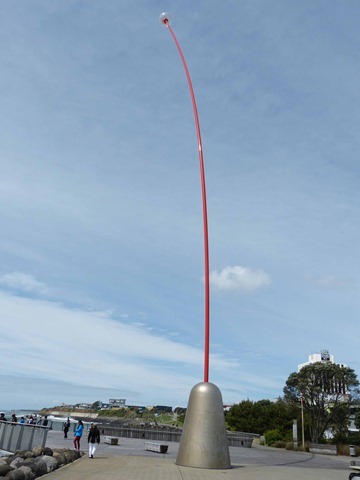 And of course, in front of the museum and in the middle of the Coastal Walkway stands the Len Lye inspired Wind Wand. 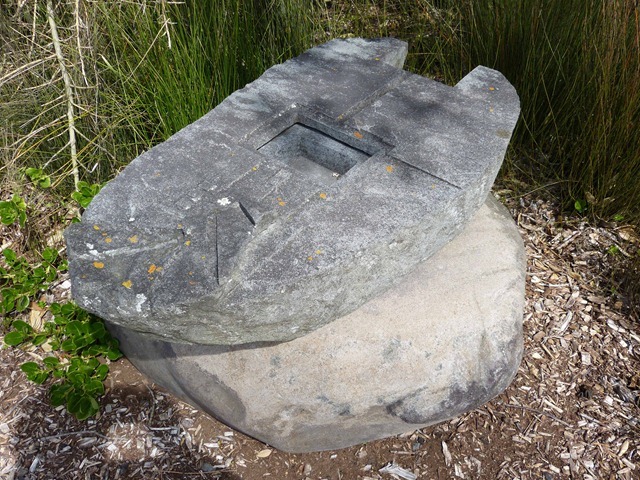 This was installed for the Millennium celebrations and the red light in the glass bowl at the top of the wand was lit at midnight at the turn if the century. 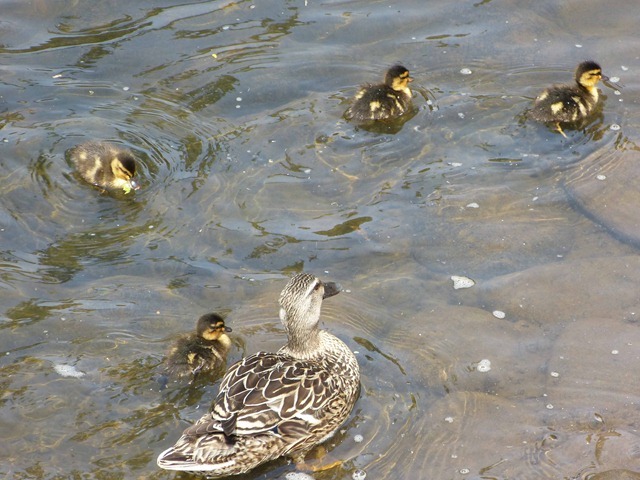 This family were enjoying a dip in the river that flows into the see at the centre of the city. 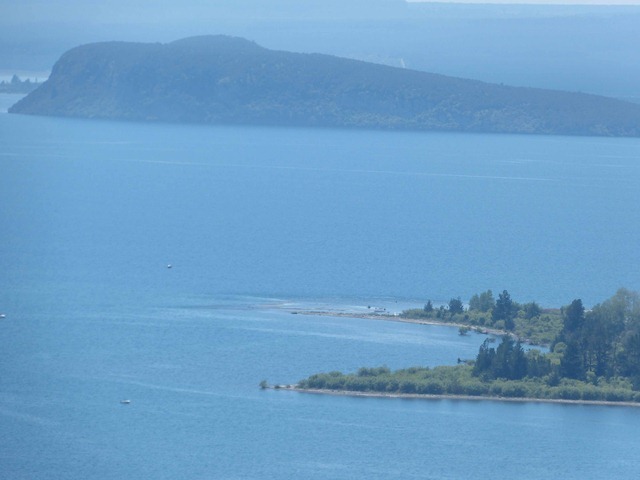 They were practicing their swimming skiills with the surge of the sea into the river mouth counteracting the flow of the river. 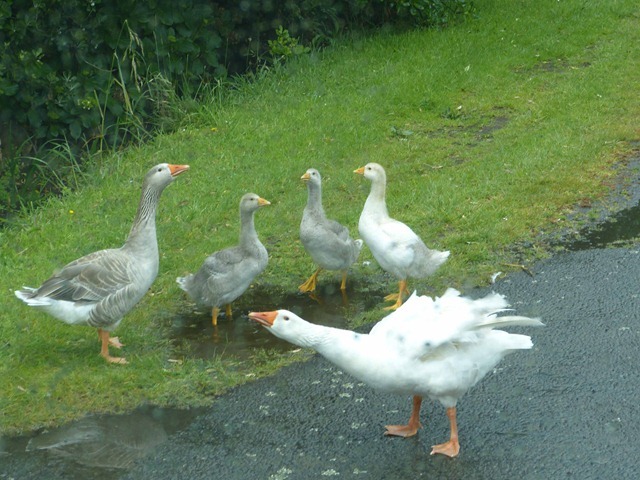 Mother was having a job keeping an eye on all four of them. Tuesday and we are on our way. First stop was Inglewood where we had been told of some amazing doughnuts to be had at a cafe there, so we thought it was best we stop and investigate. We can happily report that a full and thorough study was undertaken with samples tasted and yes, they were rather scrummy doughnuts. 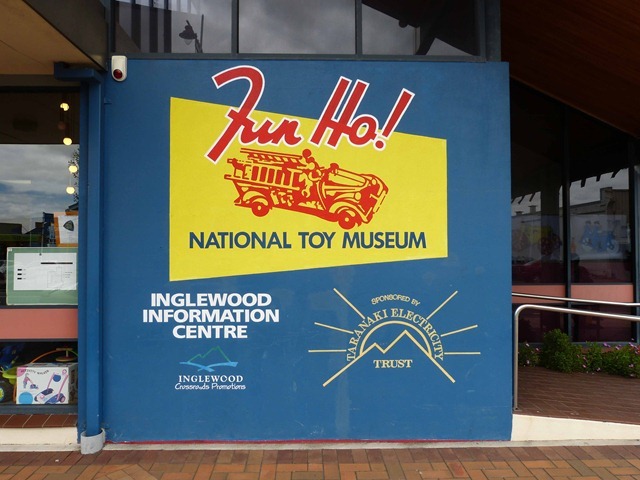 And across the road from the cafe is the Fun Ho! museum. 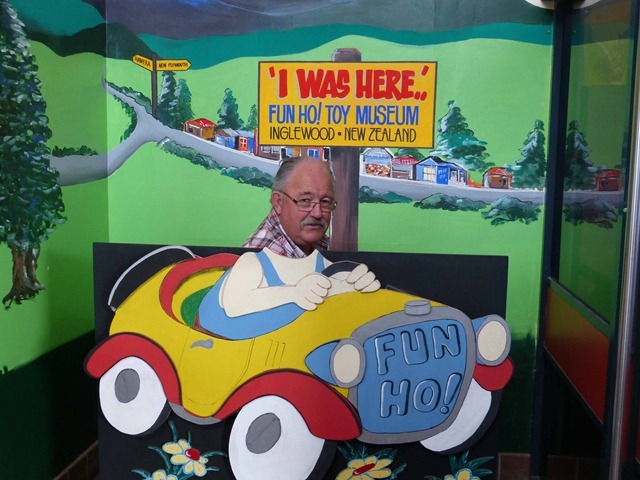 For those who have no idea of Fun Ho!, they are hand made, sand cast in aluminium, tough and durable toys. 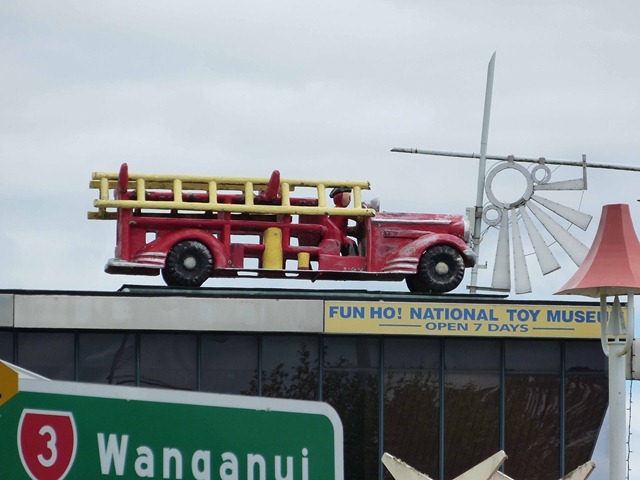 These iconic New Zealand toys were unique ‘Kiwiana’ made for outdoor use, they do not even rust when buried for years in the sand pit. Started in the 1930’s by 1982, toy production ceased and in 1987 the factory finally closed after over 50 years of manufacturing. 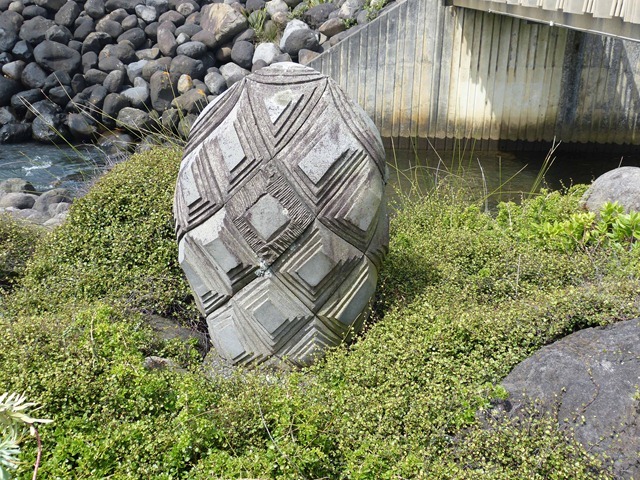 The museum opened in 1990 and since then small scale production has continued. Museum with distinctive Fire Engine on top. From there it was on to Stratford and to first find a dump station (found and a very good one it is too!) then to find a petrol station with LPG filling capabilities, also done. Then to find somewhere to park up for the night and the Stratford Golf Club is the perfect spot to stop. A quick trip down the road to Eltham to restock our cheese supplies before back to the van for the night. Some people get ahead of themselves. 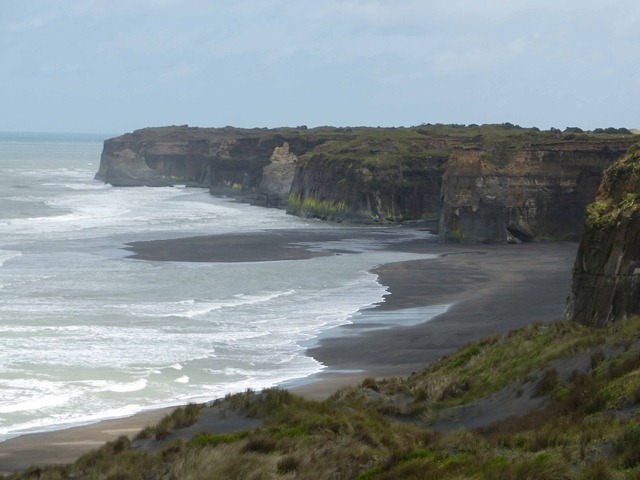 After leaving Hawera we were going to stay at Cape Egmont for a couple of days on our way north. 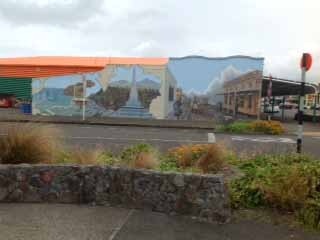 However the first stop was at Opunake where we got an internet fix at the Library and a very good lunch at the cafe opposite. 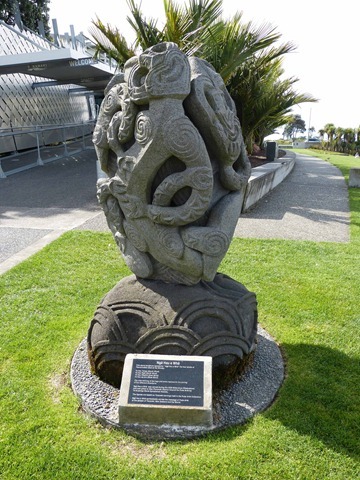 And outside the Library was this statue of Peter Snell, born and bred in Opunake. 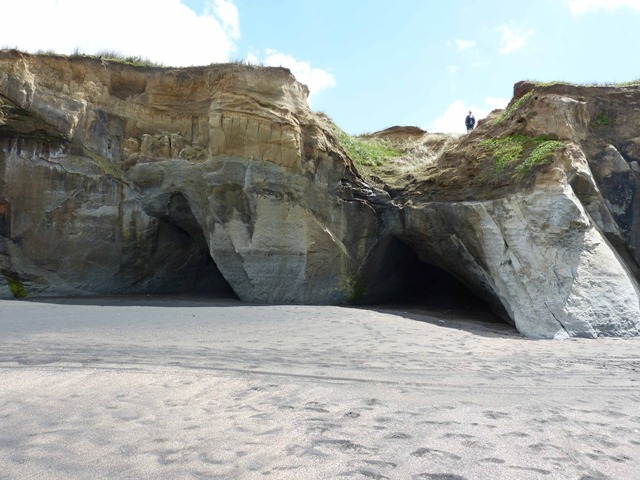 Then on to Cape Egmont. We got there to find that there was no suitable parking at all. 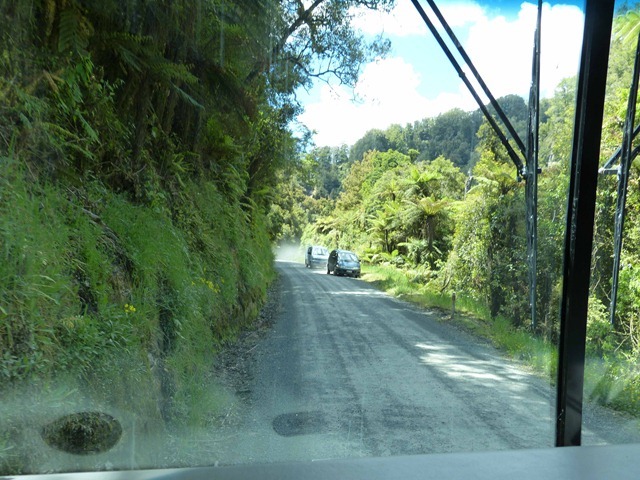 It was also at the end of a quite narrow road and had no area where we could turn the van with the car attached. So after unhook, backing and filling, hook up,we were on our way again. On the way back from the Cape we were severely challenged by a very proud father with his family. He obviously felt that this was his road. 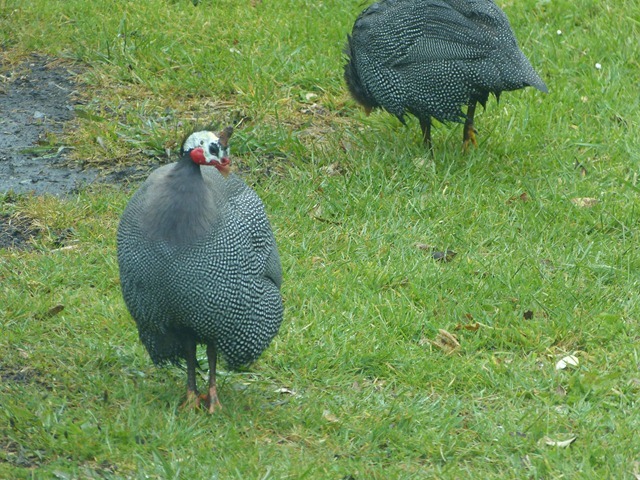 On the opposite side were a number of Guinea Fowl of varying colour. 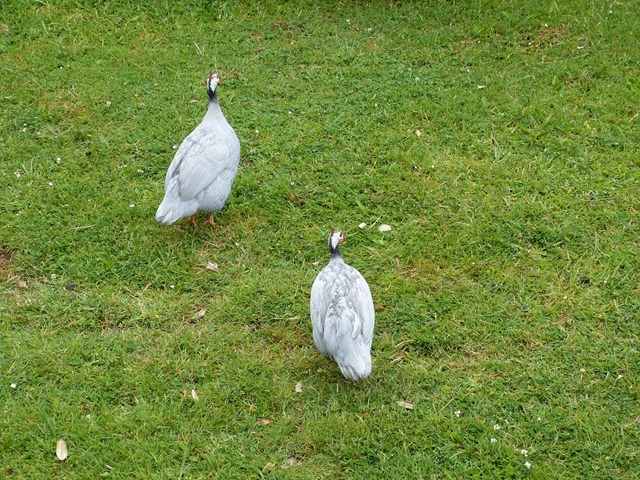 However they were not as territorial so we were allowed to proceed without hinder. Finally we reached the Kaitaki Golf Course just south of Oakura where we were accommodated behind the club house. Now the next post will be in order! After a night at Oakura we were up and off fairly early as we were staying at the Golf Club, and it just so happened that there was not only golf on early in the morning but also a Probus meeting, so rather than being blocked in by cars parked here there and everywhere, we were quickly packed up and off. 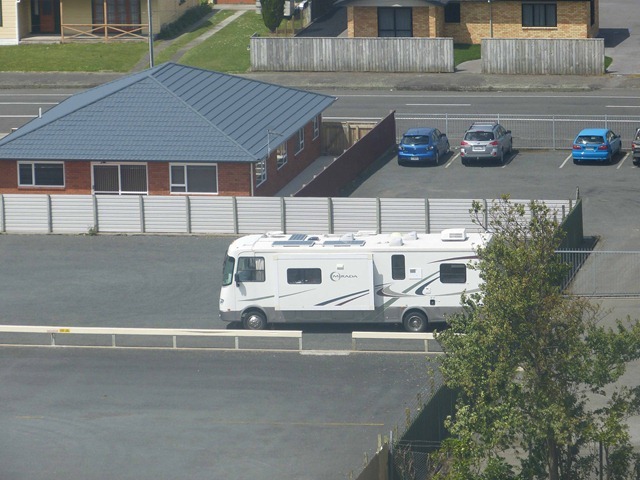 We headed for New Plymouth and a parking spot in Bell Block that was recommended by Chris & Amanda, and who just so happened to be staying at the same place. And it seemed prophetic that we had met Chris & Amanda exactly one year ago in Oamaru when they were in town for the Victorian Heritage celebrations. We were soon there, and all sorted. Well, not really sorted! We needed to fill up with LPG, and as we have a large built in tank, we need a filling station that supplies gas for vehicles rather than filling up bottles. 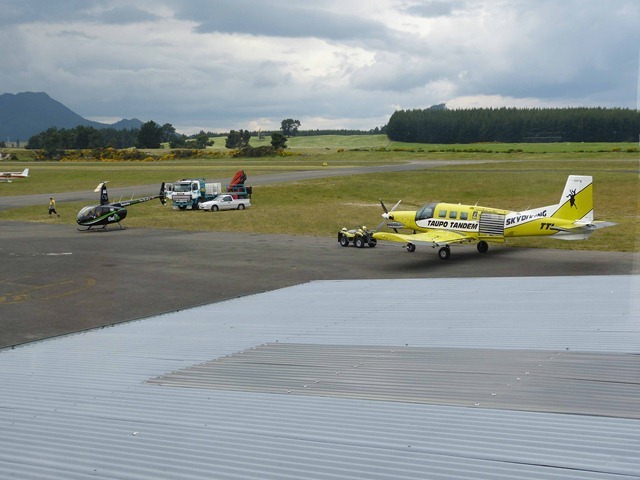 Now you would think that in New Plymouth, a town that is known as the base for the off shore gas and oil fields would have an abundance of stations with LPG filling capabilities. But no, after driving around for a good hour, we decided to park up the van, and look for a suitable station later and just trust that the 1/3 left in the tank is sufficient to keep us going for the next day or so. 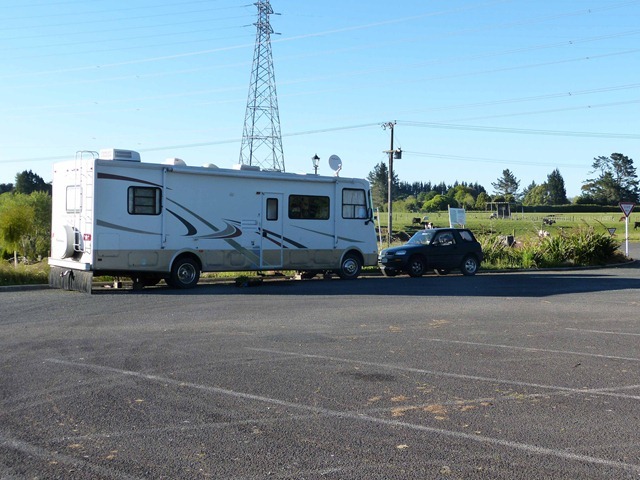 We later found such a service station in Waitara! 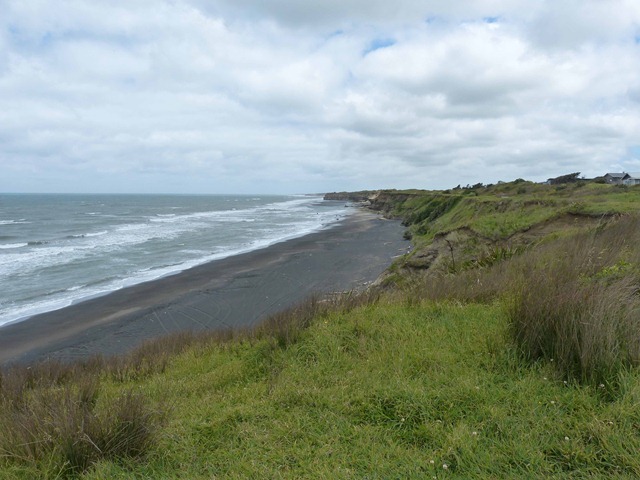 We went for a drive to Waitara to look around and see the beaches, river mouth, library and shops. 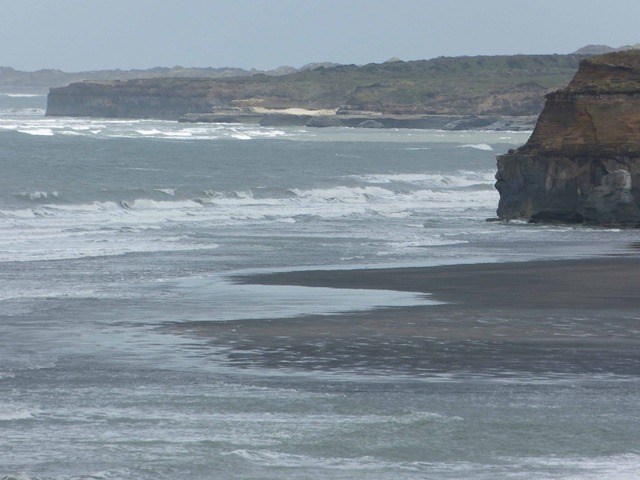 Lots of people were out fishing in the river mouth. Back to the van as Chris & Amanda were joining us for dinner. A very pleasant evening was spent catching up. Saturday morning we woke to heavy, steady rain. We spent a lazy morning, reading and relaxing before heading off into town to look at Puke Ariki, New Plymouth’s museum and library. 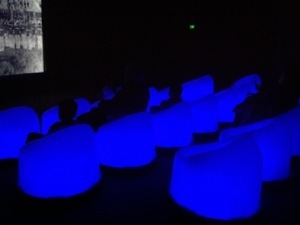 Exhibitions are excellent, first we went into a small theatre t watch a short movie on local Maori history. 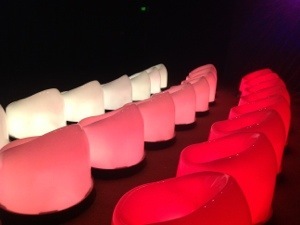 The theatre had funky chairs that were lit colorfully! 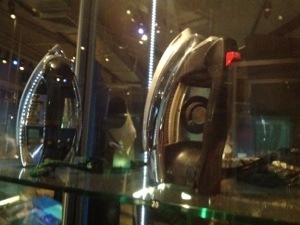 And Mum’s iron that is still in use, is a museum piece! 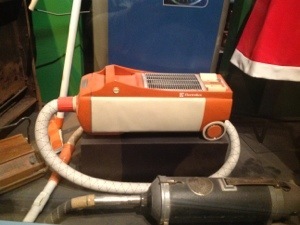 Along with her vacuum cleaner!!! And who recognizes this sight??? 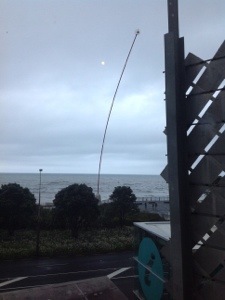 Len Lye wind wand viewed from the museum. Is just about as good as the infamous O for Awesome! 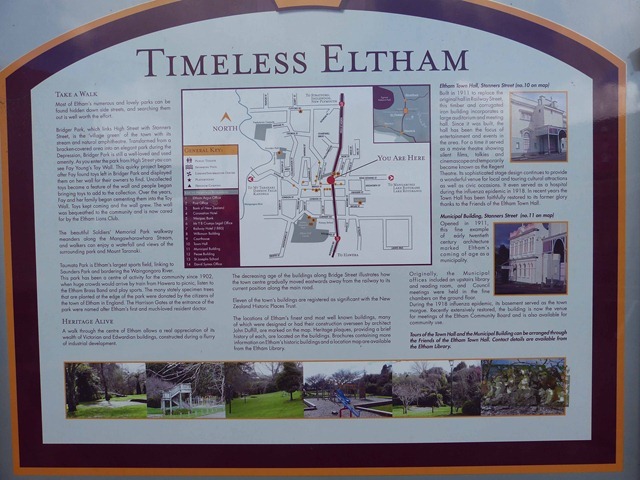 We took a drive up the road to Eltham, primarily to visit the Cheese shop and also to have a quick look around. 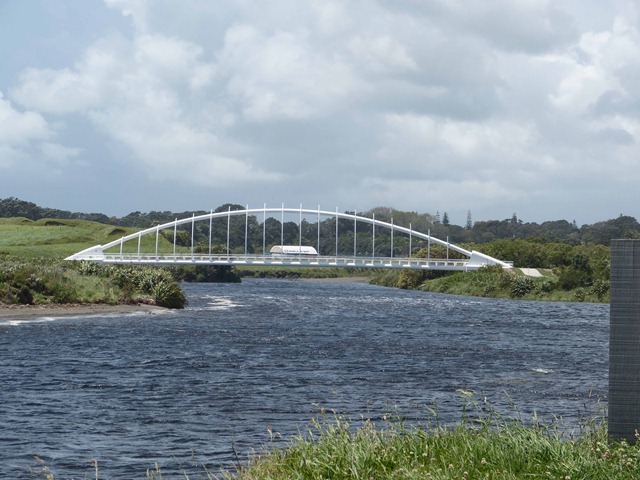 This is where Mainland Cheeses are made including a lovely Kikorangi Blue. And yes we did stock up on a few examples. 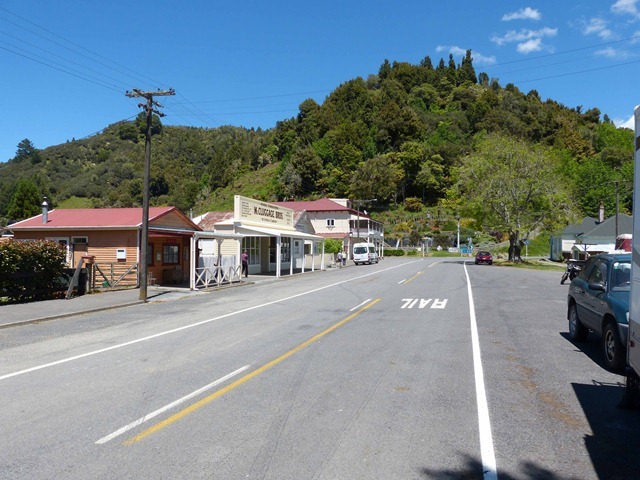 Eltham also has the distinction of having the first tar sealed roads in New Zealand. 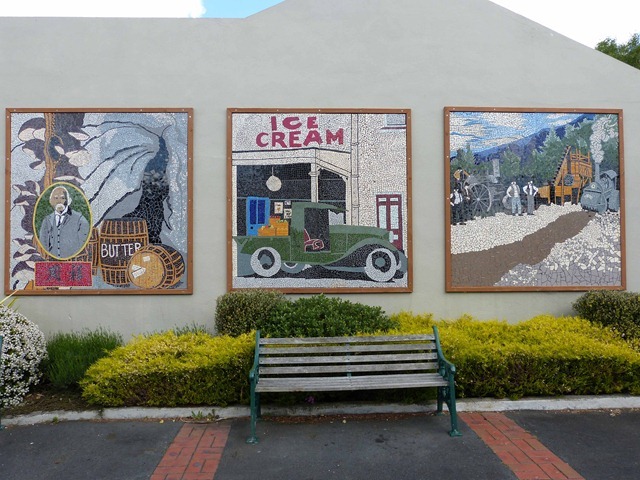 These days the main employers in the town are the Dairy Factory and Meat works. 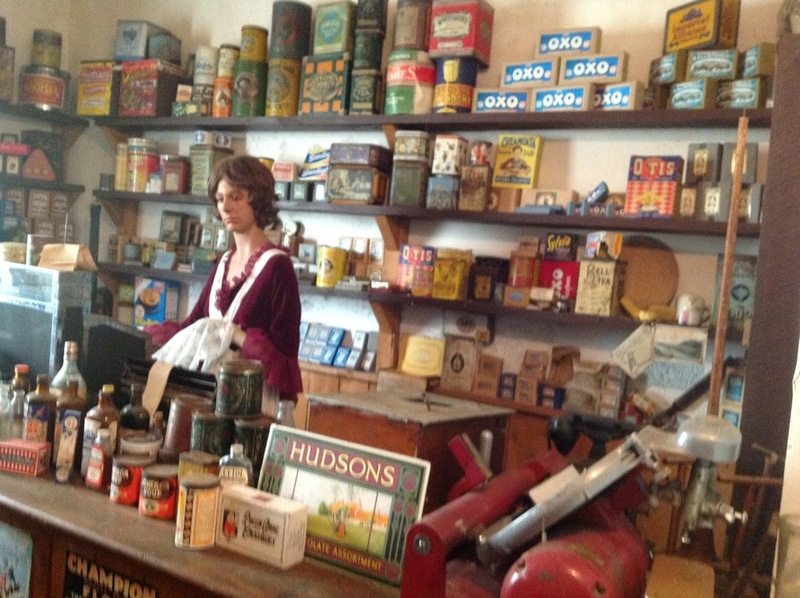 Although we must say we found a very nice antique shop on the main road. 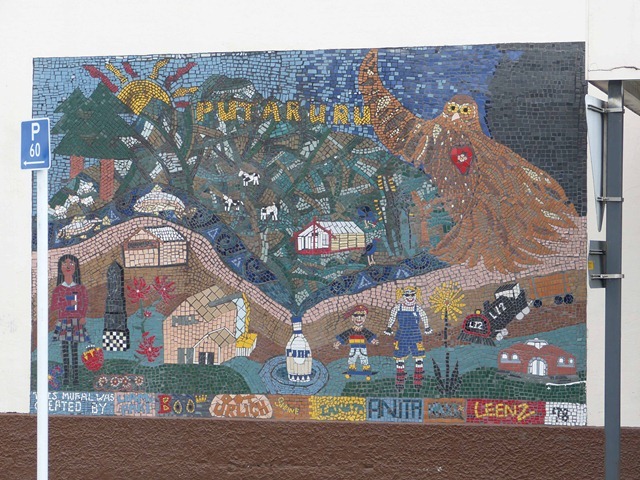 The town is rather tidy and has a number of mosaics on various buildings around the town. 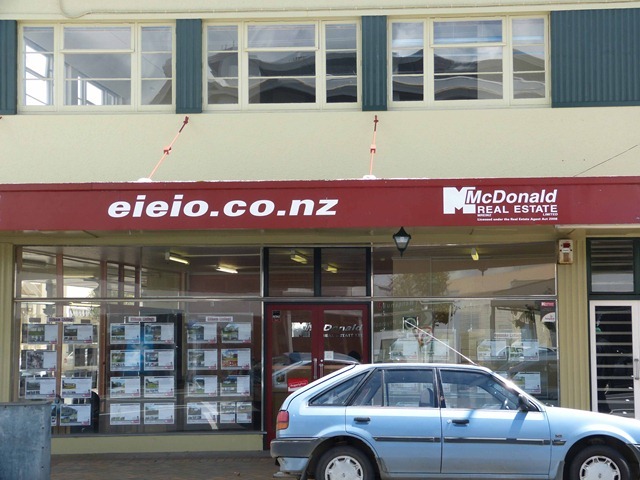 And this local Real Estate Agent (McDonald Real Estate) has a sense of humour! We should also mention that as well as sightseeing our way around the country, we are managing to keep brains active as well. Roy is currently doing a course, Introduction in Evolution and Genetics from Duke University. This is all done via the internet with lectures downloaded, and tests done. Soon he has his final exam. Bernice is making sure he is well fed and watered, reading voraciously as well as knitting for grandchildren. I neglected to comment in the last blog that whilst at the Tawhiti Museum, we also had a look at their latest exhibition area which is dedicated to Ronald Hugh Morrieson, renown author of Came a Hot Friday, Pallet on the Floor, Predicament and The Scarecrow, all of which have also been made into films. 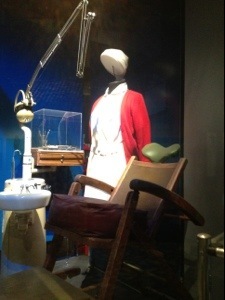 The exhibit contained his bedroom and lounge room as well as a film set from Predicament. Well worth the visit. 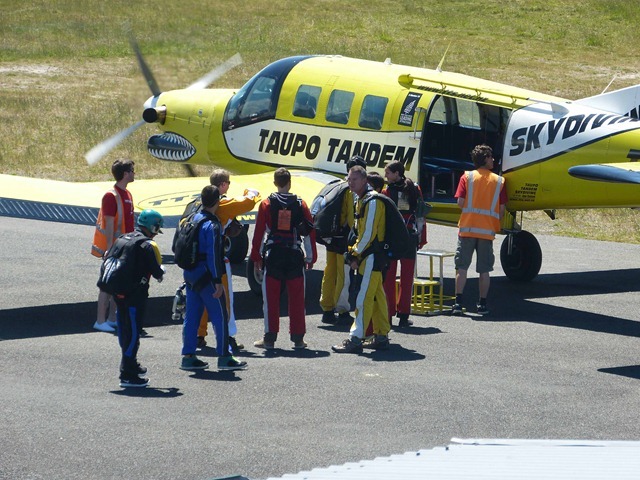 So what else is there to do and see in Hawera? I did try and convince Roy to go to the Elvis museum but he was rather indifferent about that. 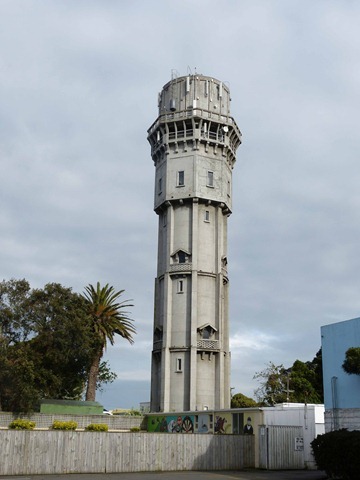 So whilst Bernice made use of the free wifi at the Library, Roy climbed the Water Tower. 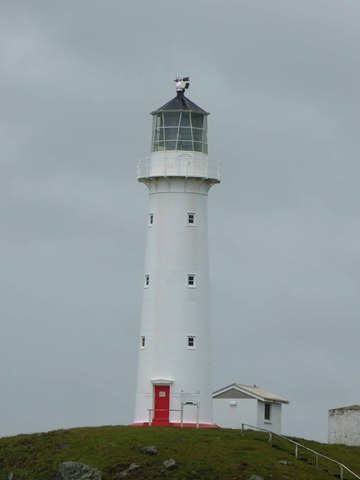 The top of the tower is 54.21 metres and the height to the terrace is 45.72 metres. There are 215 steps to the gallery. Hollow inside from the base to the uppermost level where the tank sits, there is a spiral staircase around the inside of the outer wall. 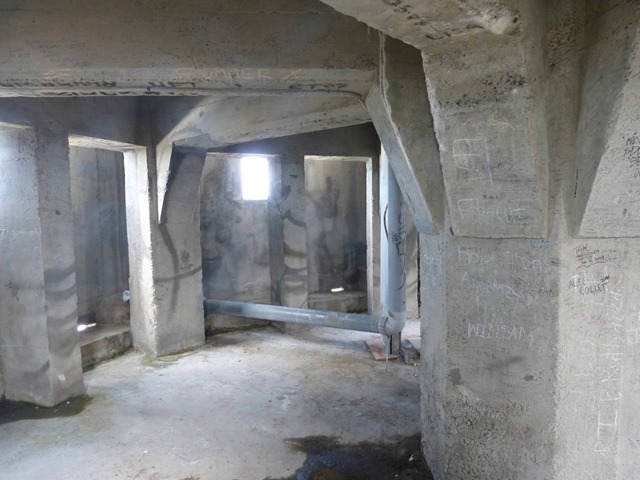 There are two floors at about a third and two thirds of the way up the tower. Showing the top of the floor of the two thirds level. 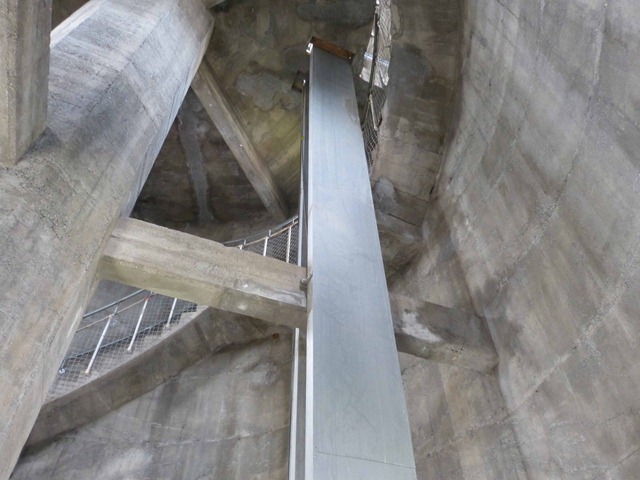 I mistook the steel framing for strengthening but it turned out to be casing for the power cables to the lighting and transmission facilities at the top of the tower. Looking down from the underside of the first third floor down to the entry floor (on the left of the railings) into the basement (on the right of the railings). 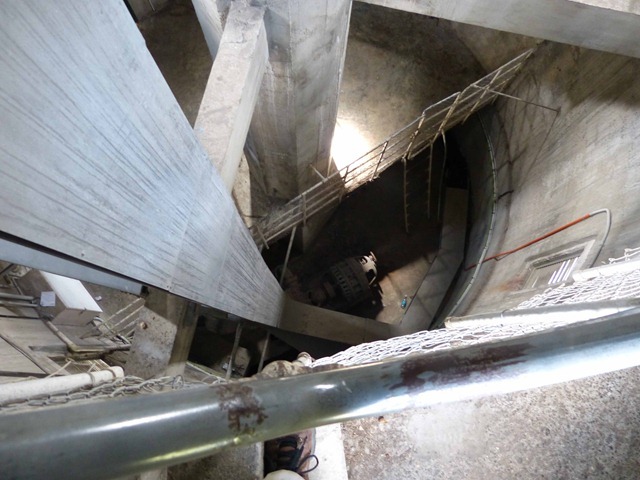 This is the final floor directly under the tank on top. 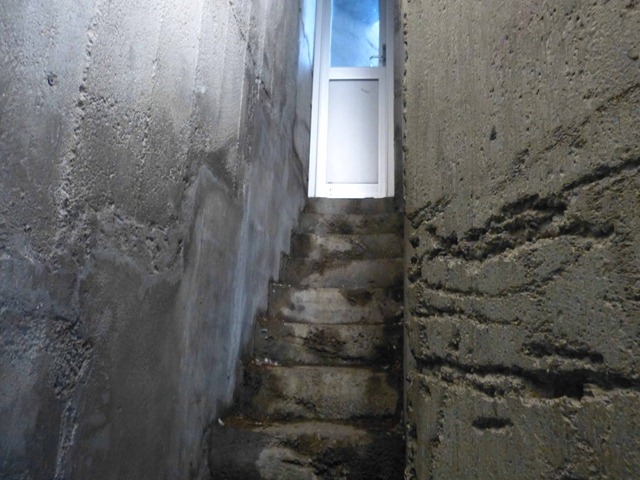 The final staircase was a very narrow affair which had to be lighted even in the middle of the day in order to see ones way. This is the last stretch to the door. Finally from the top there was a good view of our home from the top, with a little telescopic assistance. 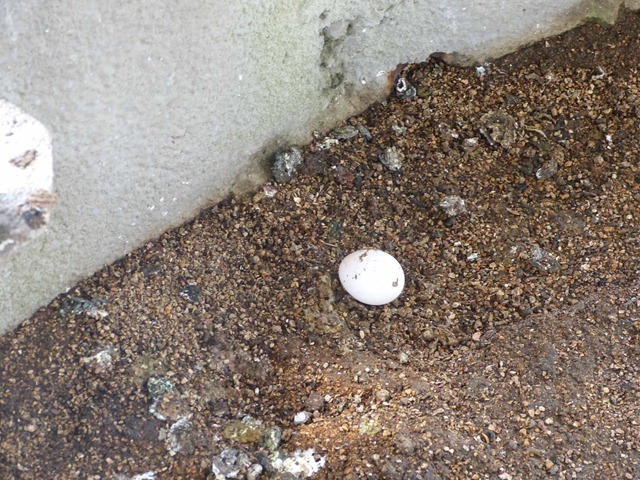 On the floor of the terrace around the top there was this pigeon egg atop the heaps of pigeon droppings all around the terrace. 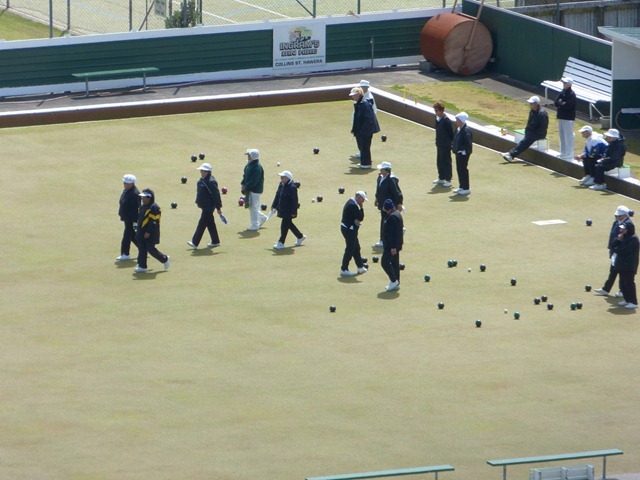 And with a little assistance from the lens one can see who is playing. 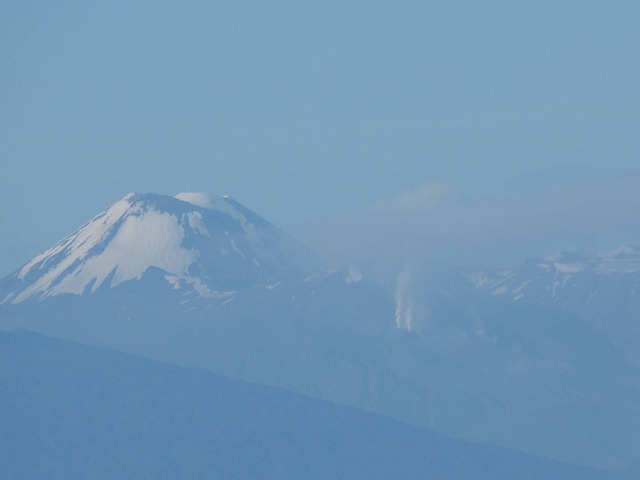 Believe it or not this shot is looking directly at Mt Taranaki but the low cloud obscures the upper heights. 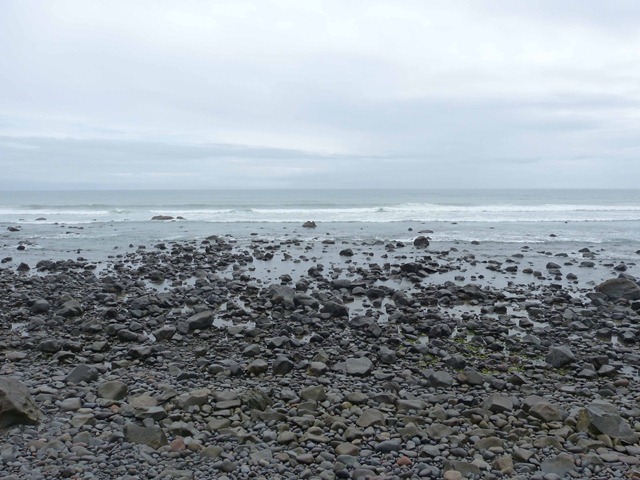 We then decided to go to Waihi Beach, which was advertised as a surf beach, but it appeared to be more rocks than beach. 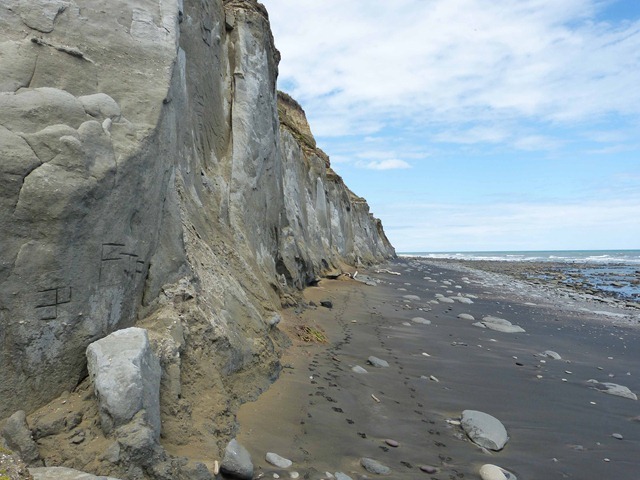 Huge cliff faces of sandstone are gradually eroding and huge slabs, the same height as the cliff. The next piece to come adrift is splitting away as you can see. 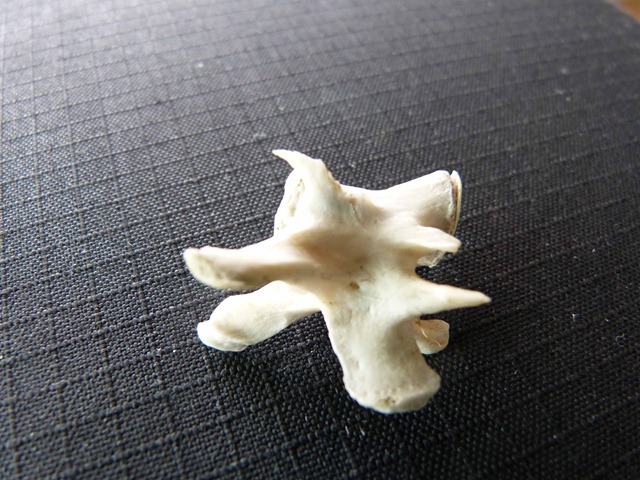 Another mystery find is this vertebrae. A most unusual shape. 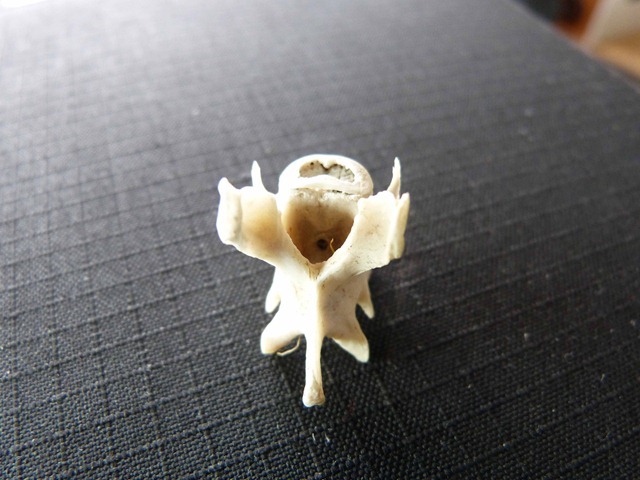 Someone may know what it is from it is approximately one 1cm long. Its called a EniCycle – or Electric Unicycle. 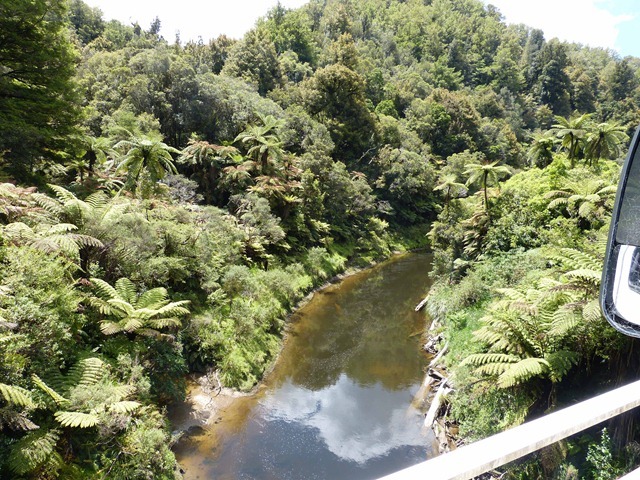 These tracks would be very rare indeed as, according to Statistics New Zealand, none have been imported or sold in NZ yet ! Now that sort of information is worth at least 3 rums !! 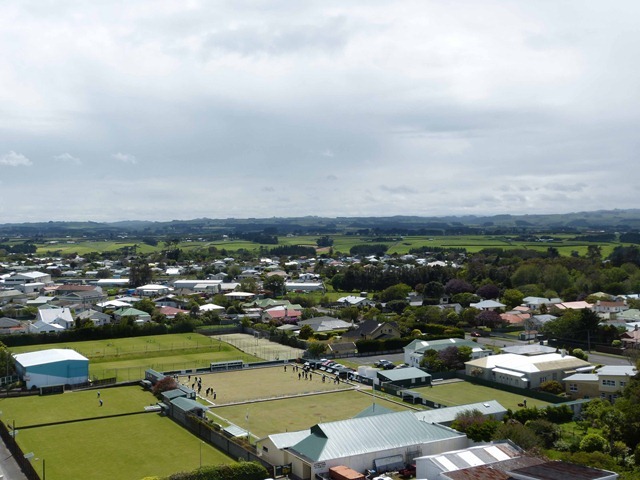 So what is there to do in Hawera? We asked ourselves exactly that when we arrived here lunchtime Monday. 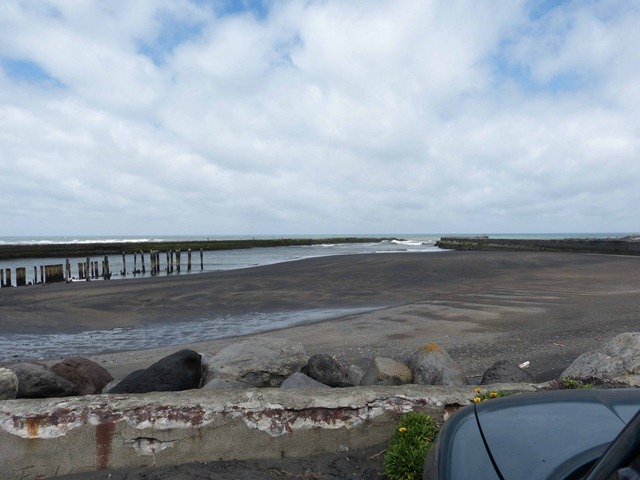 After setting ourselves up at the South Taranaki Club, which is a very nice parking spot complete with dump facilities, water and the usual Club facilities, we popped into town to grab a bite to eat and to see what there is to see and do. 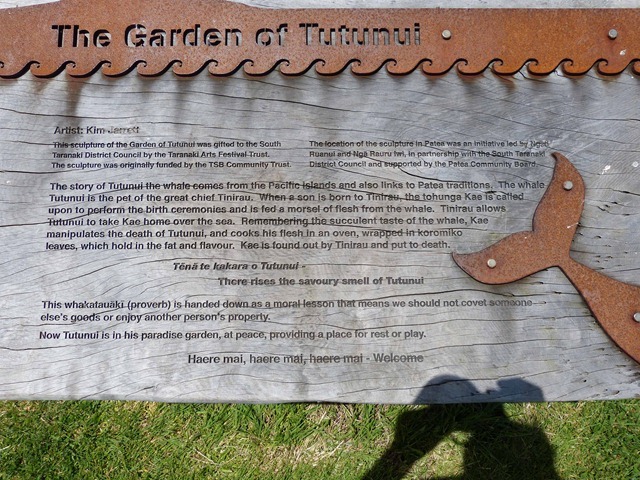 One thing we had been told to go and see was the Tawhiti Museum. So off we trotted. 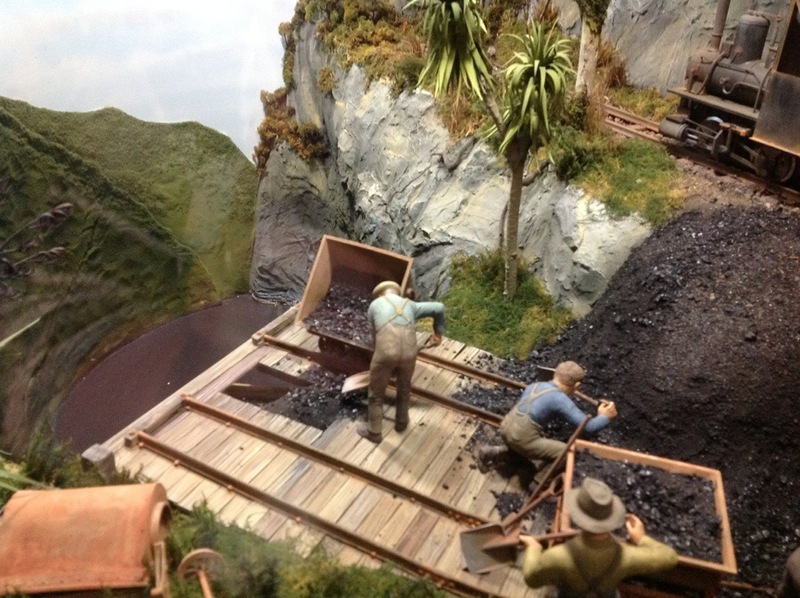 This is a museum celebrating New Zealand’s heritage through life size exhibits and scale models to capture the past in a series of realistic displays and diorama’s. All the displays are designed and built on the premises and are the brain child of Local artist Nigel Ogle. And what detail! 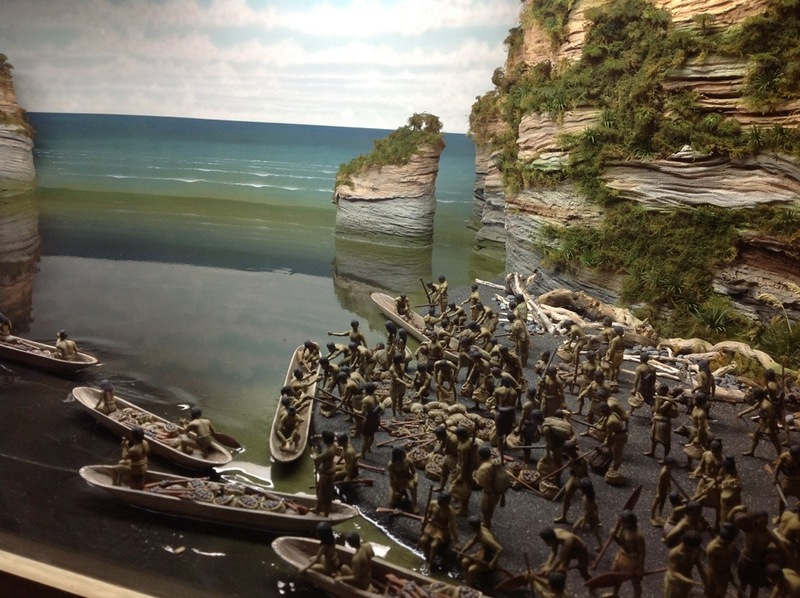 The figurines range from life size down to one inch scale and are displayed in amazing landscapes, social perspectives and include artifacts. 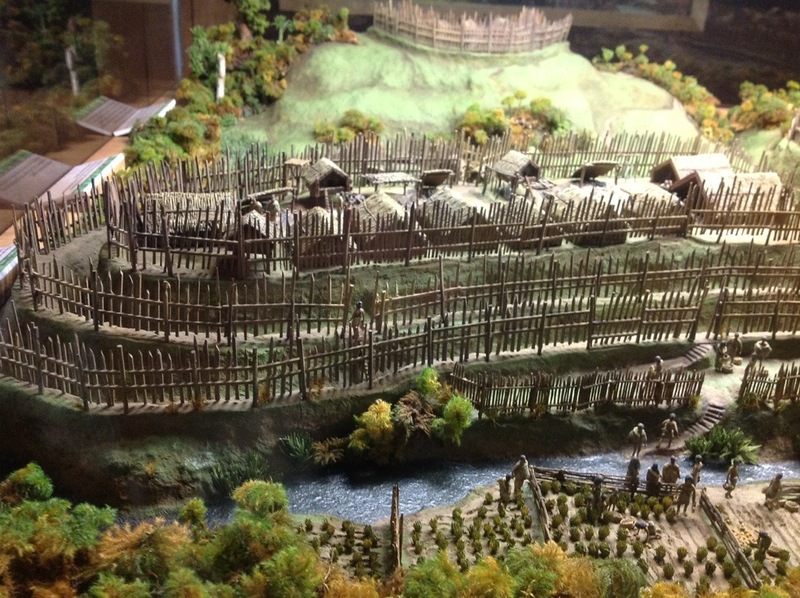 From Maori Pa sites, through to trading scenes, wars, colonization then on to a social history of dairying, railways, agriculture, livestock, and general daily life, the displays seamlessly led you through the eras. 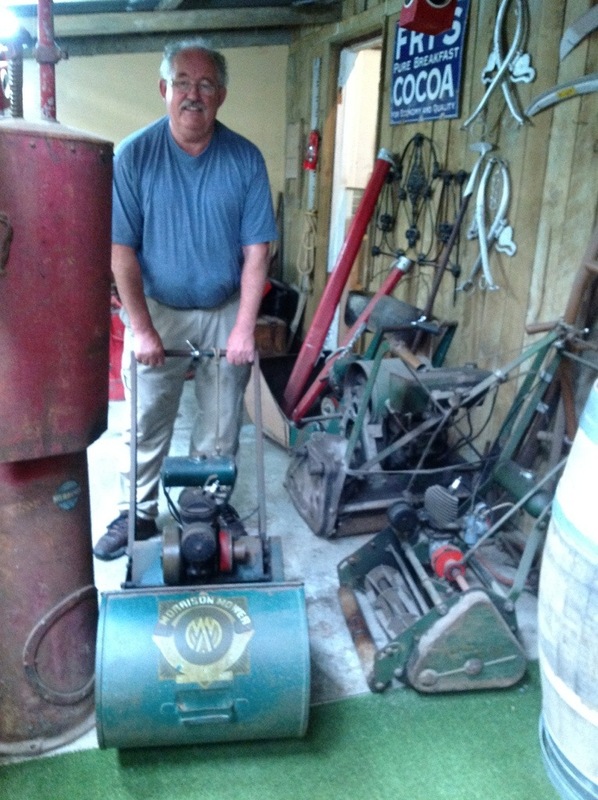 We even found a lawnmower that matched the age of the operator!! 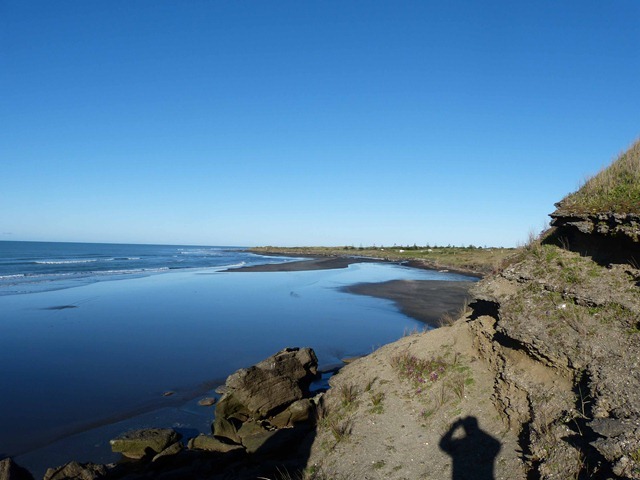 Waiinu Beach on a glorious day . 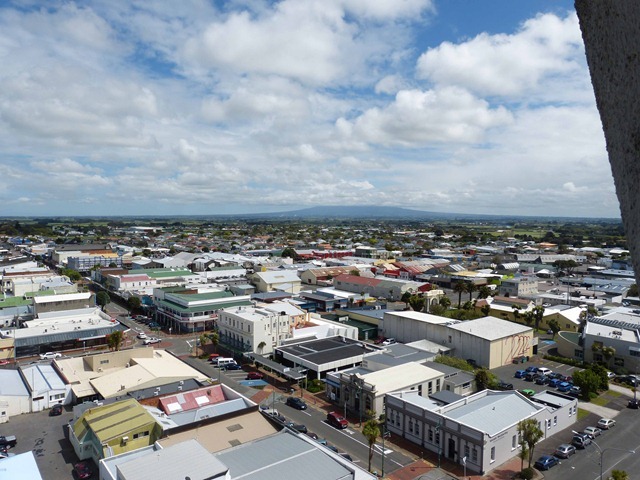 Friday morning and we headed off into W(h)anganui for a day of research, laundry and shopping. The research was all genealogy related. First stop was to visit the Fire Station to see what historical records they kept as Roy’s father was in the Fire Service in Wanganui when he returned to NZ after WW1. Then it was off to the library and to the archive library. We found a few pieces of information to add to our files. Then it was off to do the essentials before heading back to the van to watch the start of the Fast5 Netball series. What a great start to the Netball, the next two afternoon/evenings are going to be well spent watching all the games. Saturday and we decide to head out for the day (making sure we are back in time for Netball of course) first stop being Waverley…..the place, not the character form Outrageous Fortune! 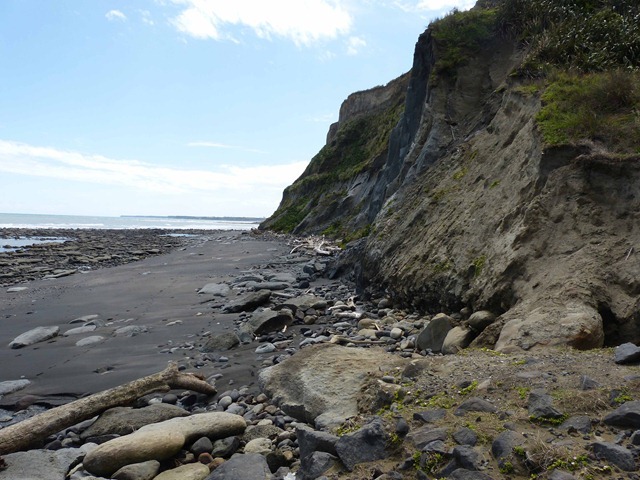 We headed out to Waverley Beach where we found access to the beach from the top of cliffs. 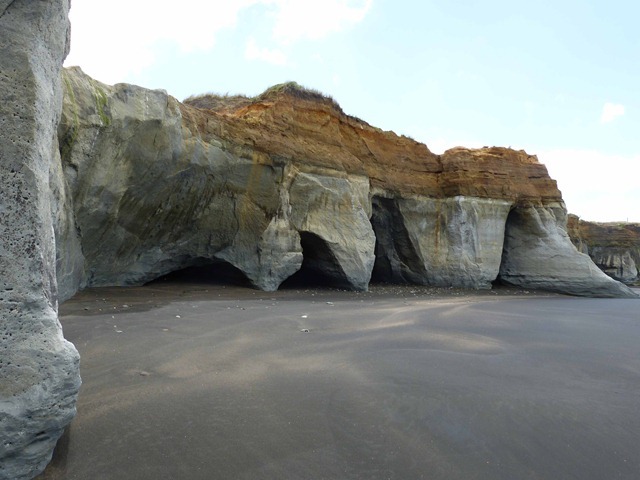 The cliffs are peppered with caves. 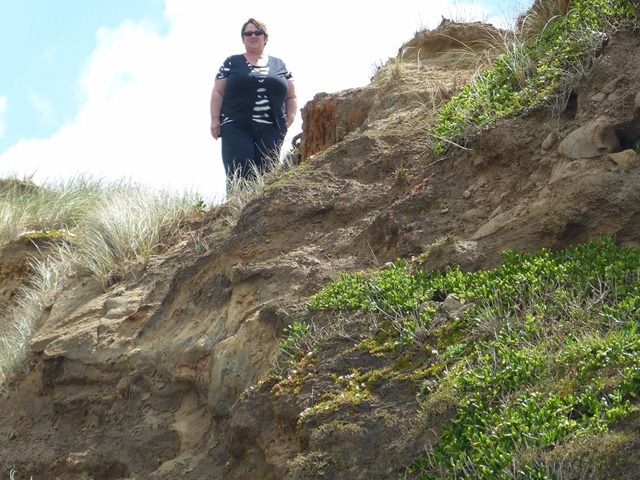 Who is that at the top of the cliff? Aah, that’s who it is! 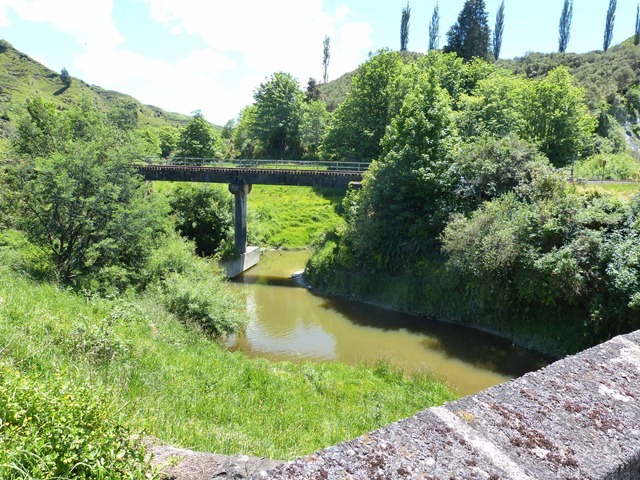 Next stop further on up the line is Patea. 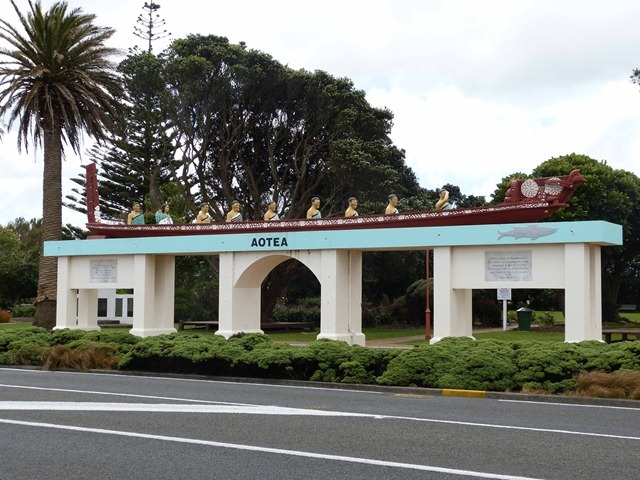 In the 1920’s Patea was the largest cheese exporting port in the world. The Port closed in 1959 but from our view of the entrance to the Port/River, the ships captains would have had to be extremely cautious as the entrance is very narrow. The freezing Works were a major employer in the town from the late 1880’s through to their closure in 1982 when over 800 people lost their jobs. 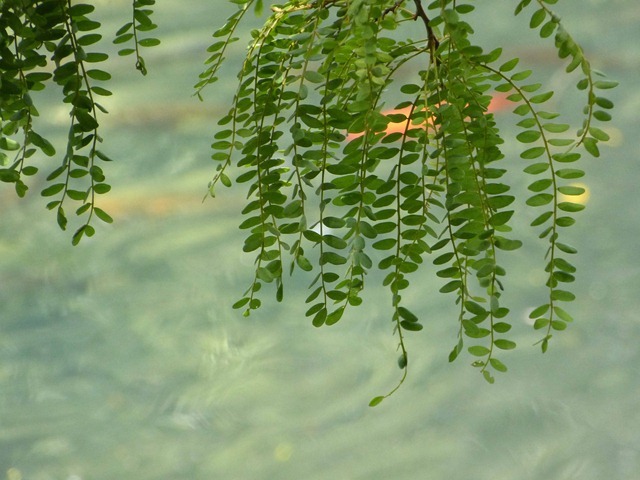 This was a major blow to the town resulting in gradual loss of population over the years. 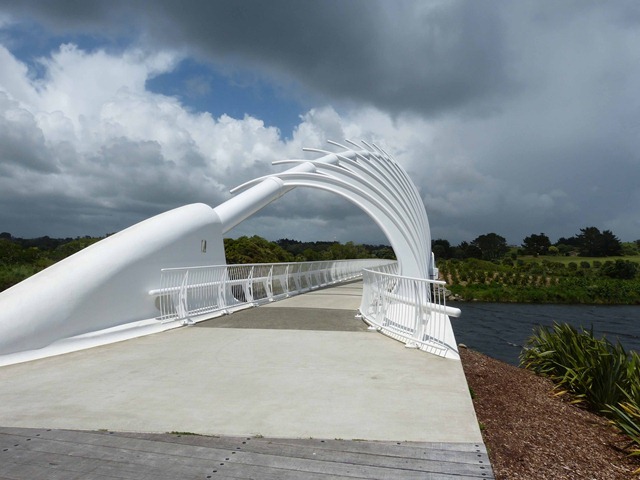 The Aotea Canoe Memorial arch made famous by the Patea Maori Club and the song Poi E. Tried my best Michael Jackson impression but it was not the same without the one white glove! 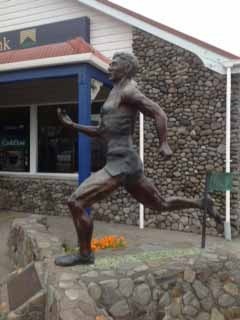 We also paid a visit to the South Taranaki Museum which was excellent and we can highly recommend a visit if you are in the area. 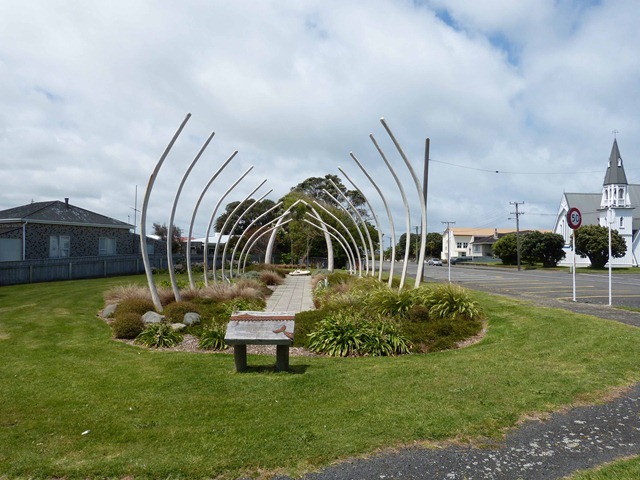 Also in the town is this impressive sculpture made of a set of whale rib bones (well actually fibreglass). Along with an explanation of the legend that goes with it. Back to the van again for another evening of Netball watching. 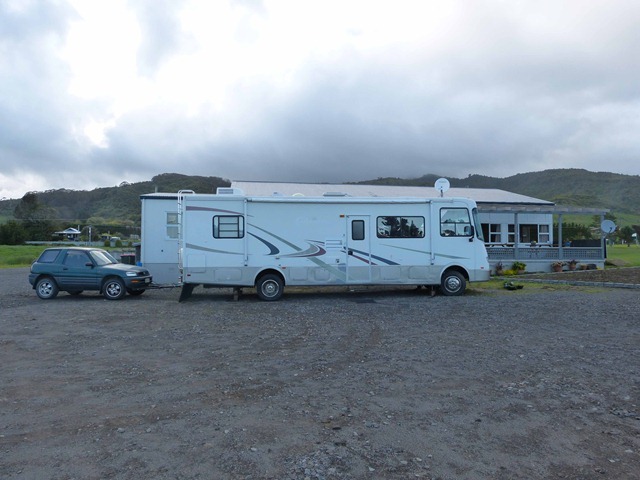 We had planned to leave here on Sunday morning, but we decided to spend another day here, Monday we will be off to Hawea. PS . After a nail biting finish, the Ferns won the netball – Yahoo! 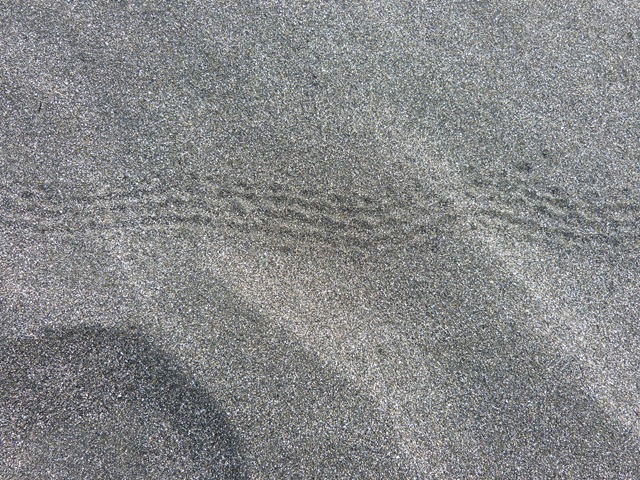 Mystery of the week, what on earth makes a trail like this! 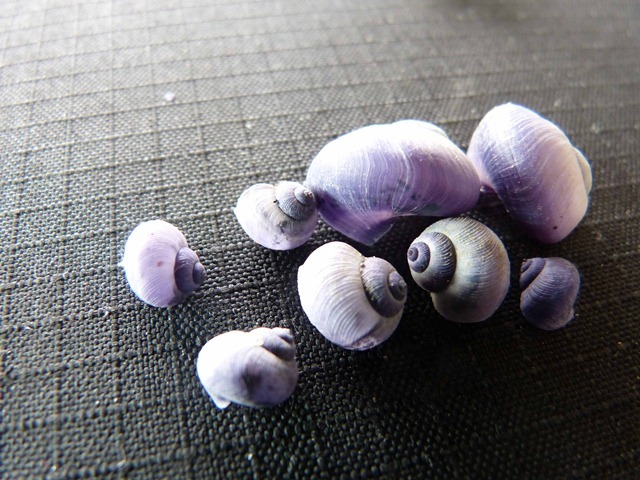 It is about 3 cm wide and is impressed into the sand in the sand hills behind the beach. The nearest i can come to is some form of multi legged insect of some sort, which is probably a hell of a long way from what it is actually. The right answer might earn a rum… perhaps.